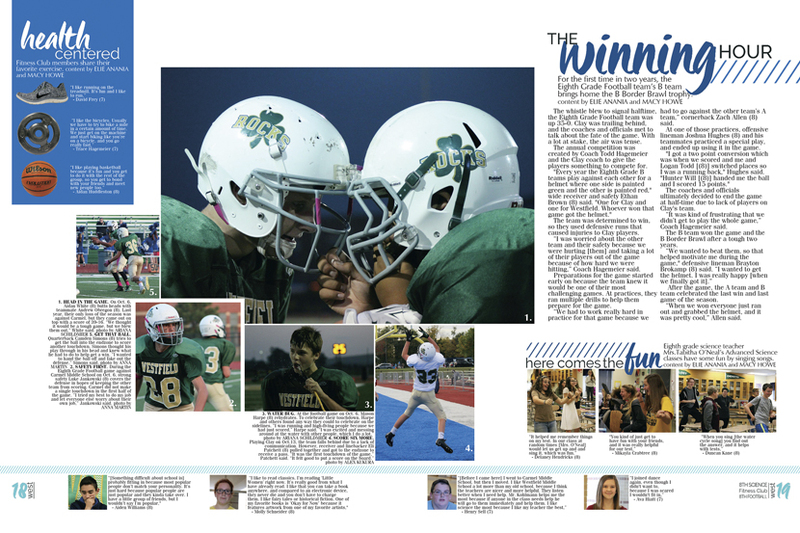 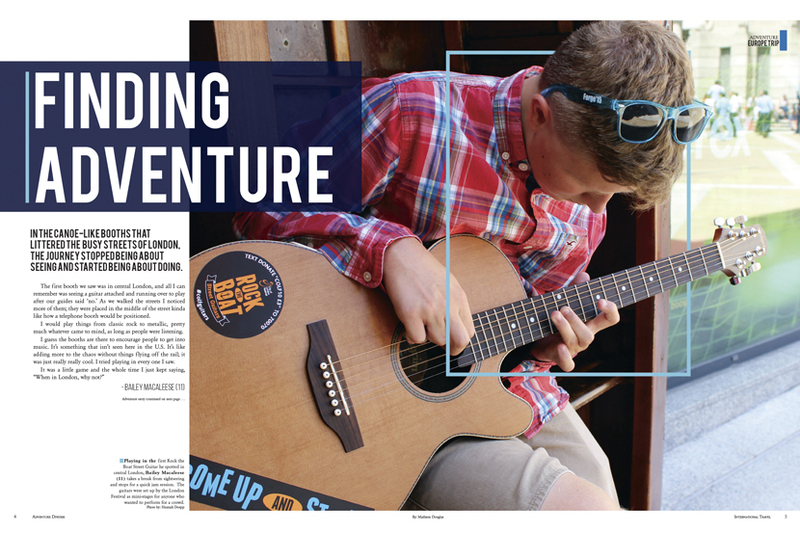 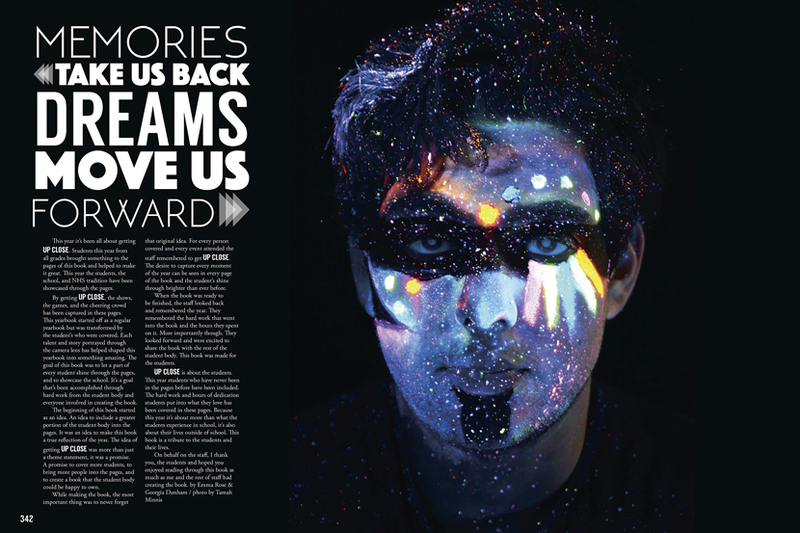 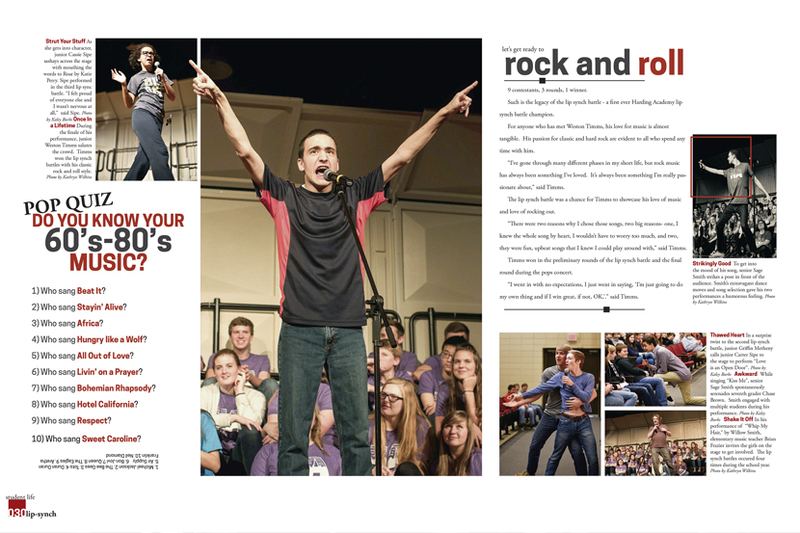 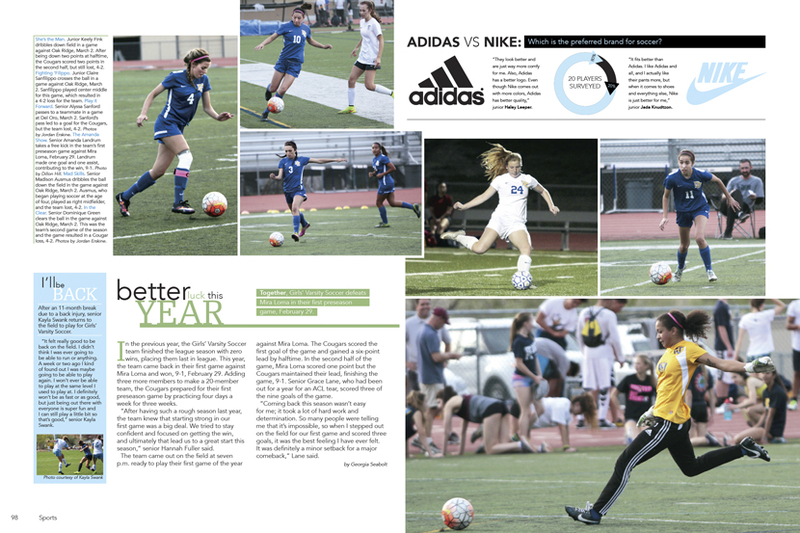 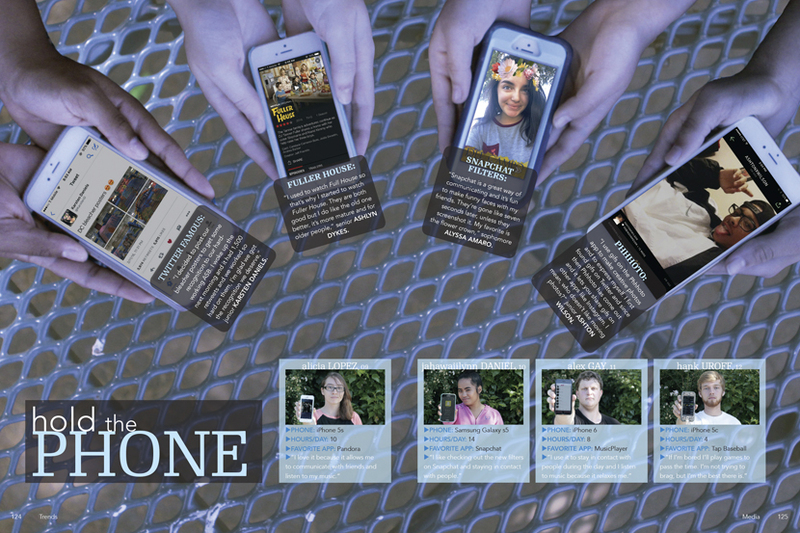 These 2016 staffs used their themes to tell the unique story of their year, from the cover to the closing. 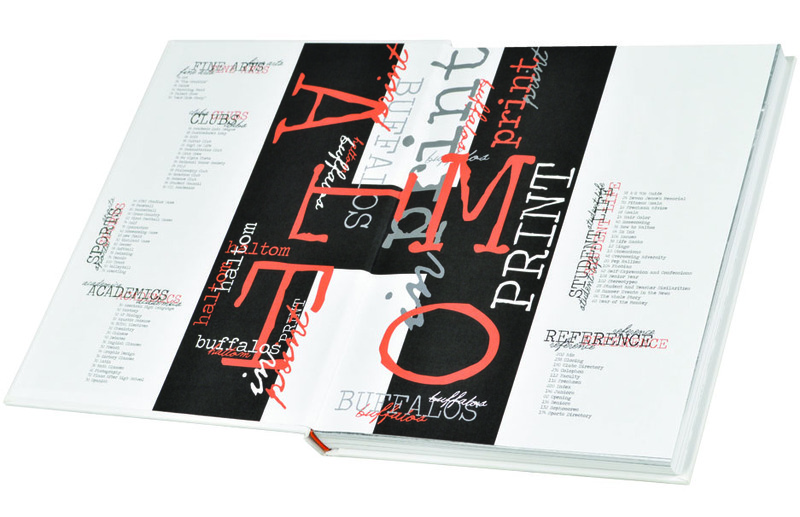 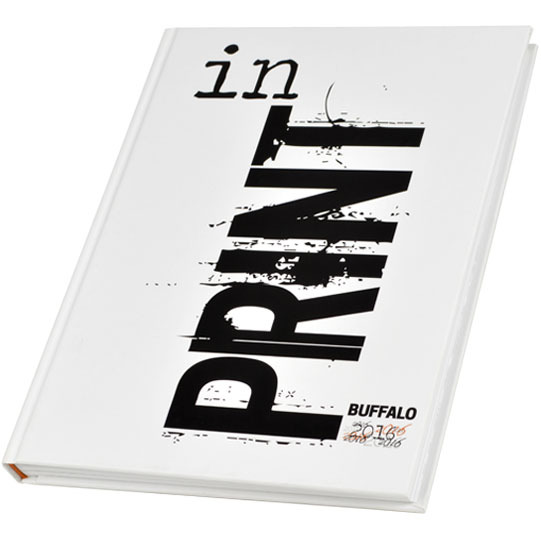 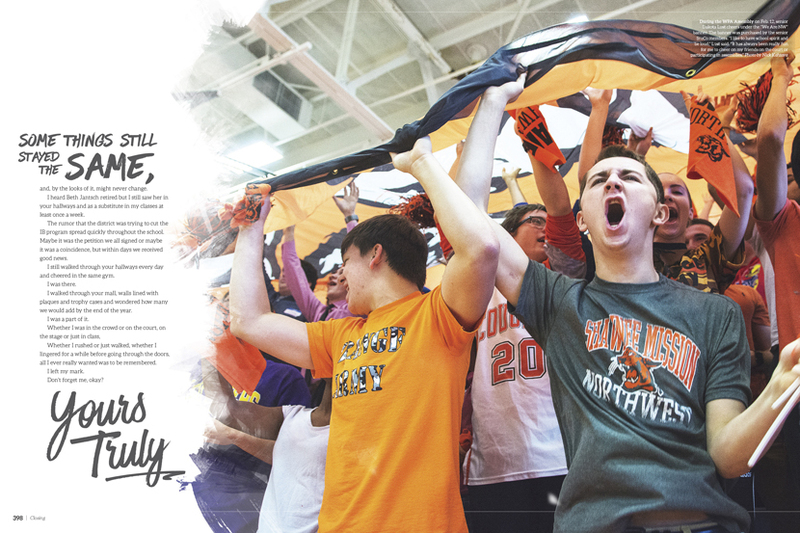 On the opening pages of the 2016 Trail, copy written by senior Art Director Austin Pruett clearly explains the staff’s ambitions with their striking book. 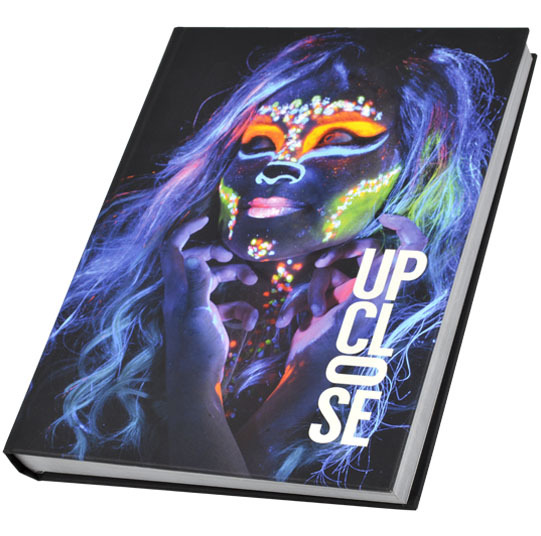 “I knew exactly what to do to make this one ‘the one’ that will leave everyone talking.” The Norman staff’s execution of the theme “Up Close” is about as personal as it can get. 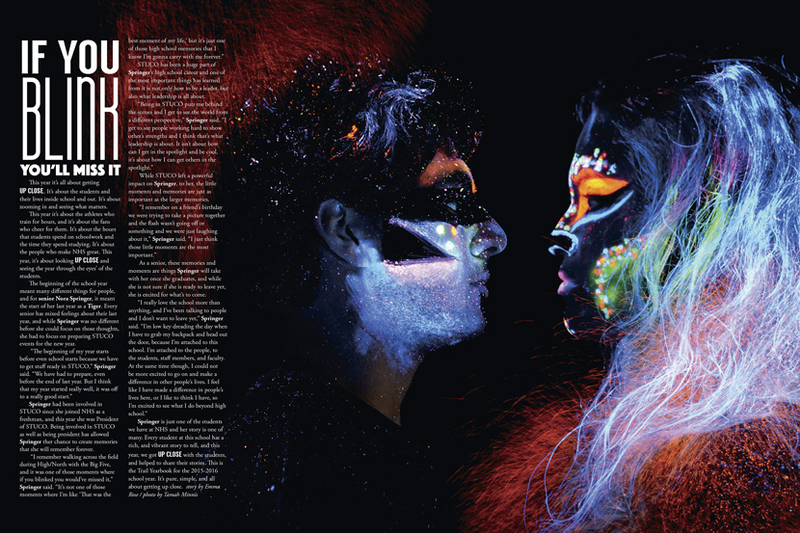 The book’s entire look and tone is set immediately on the cover with an eye-catching portrait of student Lexi Audas in glowing Tiger makeup against a simple black background. 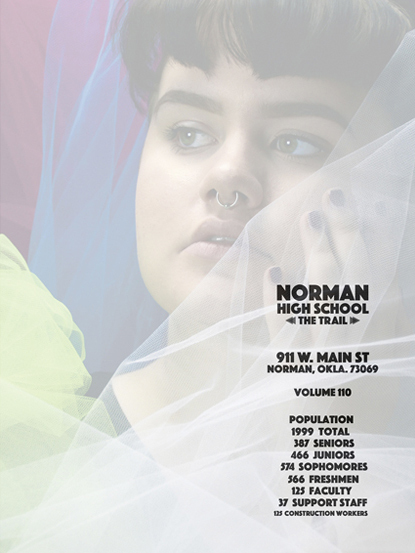 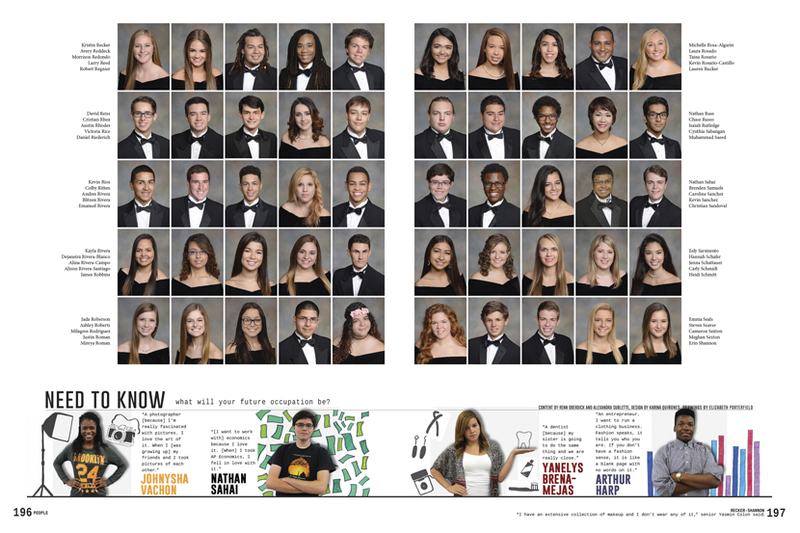 The opening copy tells the reader that the year is “about zooming in and seeing what matters.” So the staff got “Up Close” by telling dozens of student stories, many of them accompanied by fun portraits that showed off the personality of Norman High. 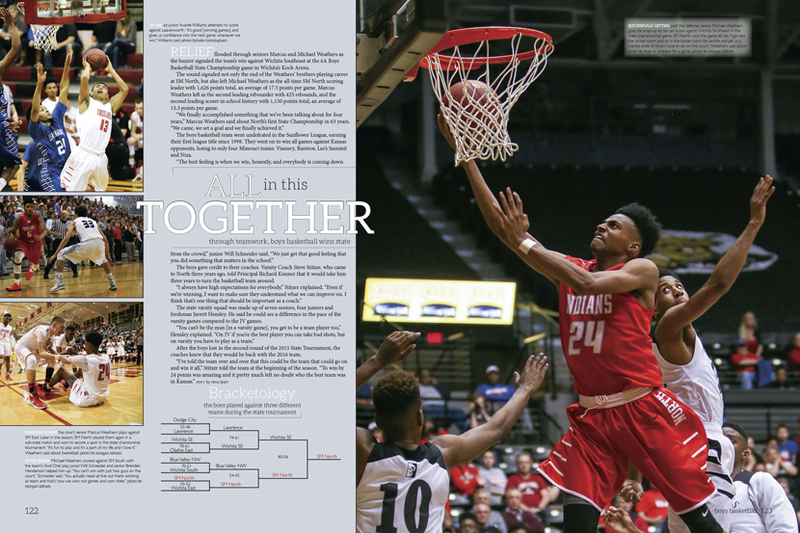 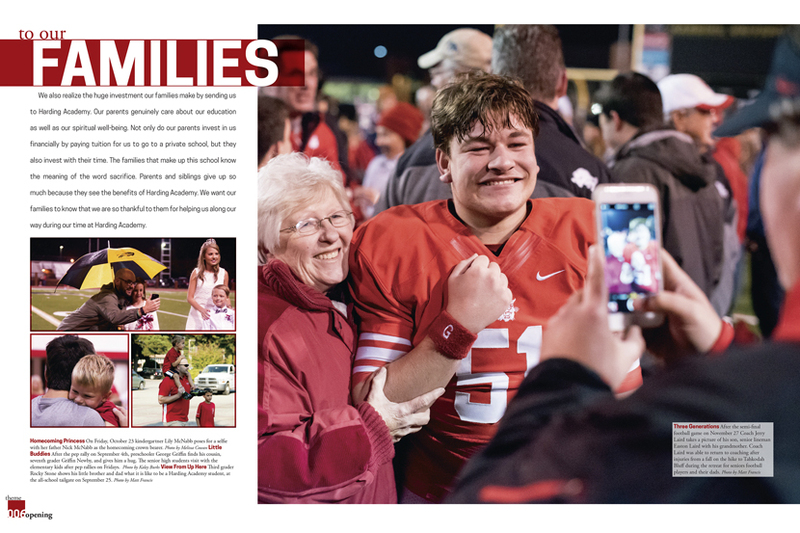 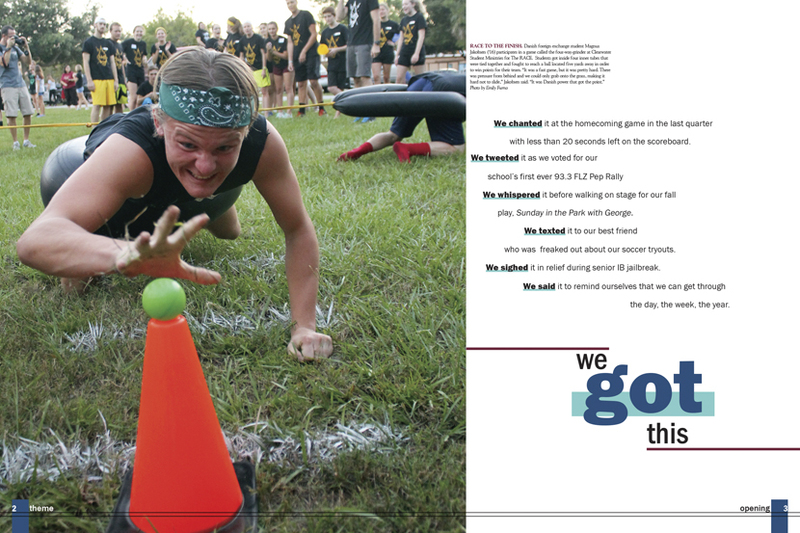 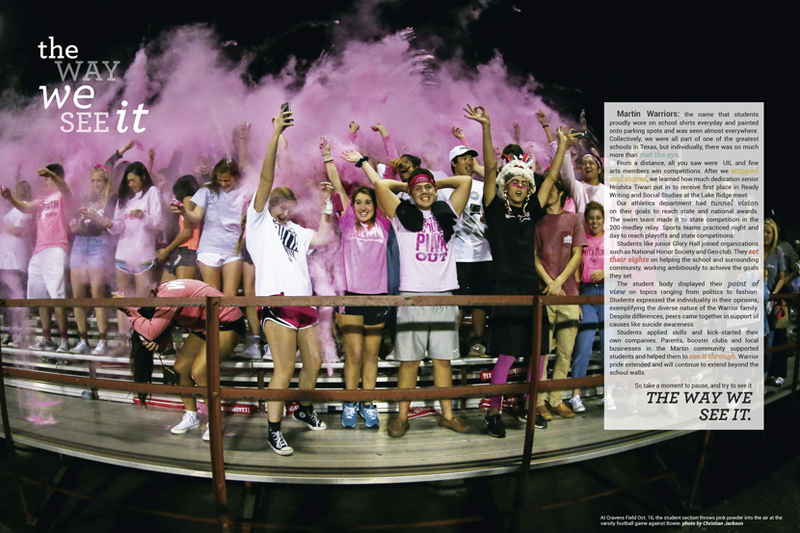 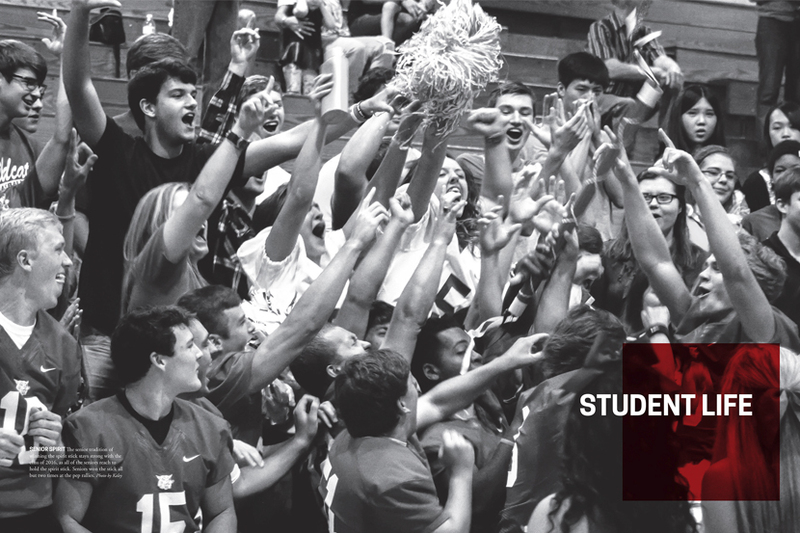 In the 2016 Wildcat, the Harding Academy yearbook staff took a simple, well-known, three-word phrase that played off their school color, “In the Red,” and gave it special meaning for their school and their year. 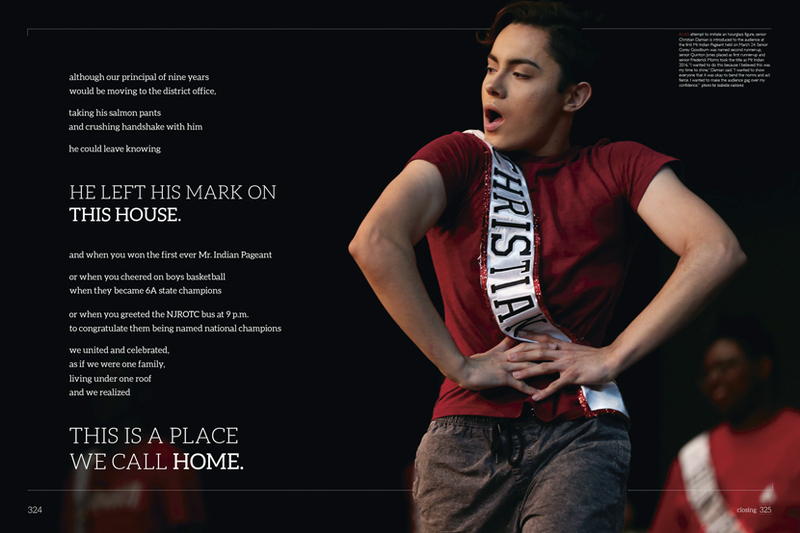 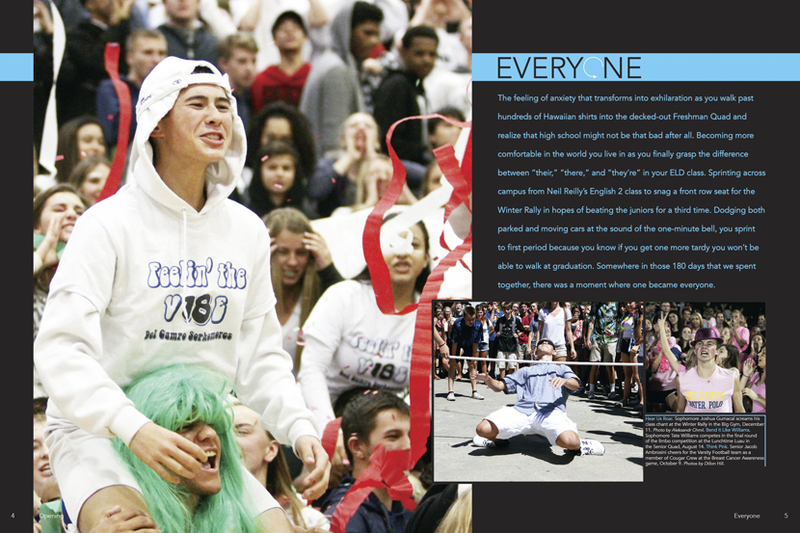 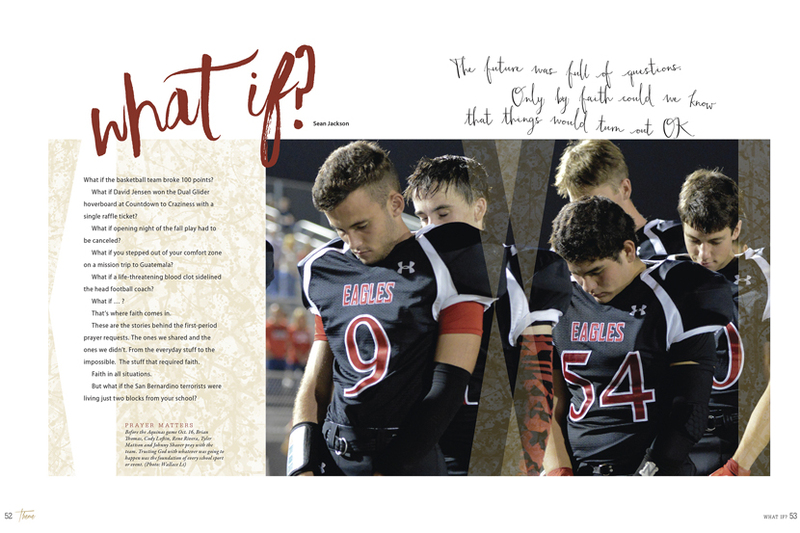 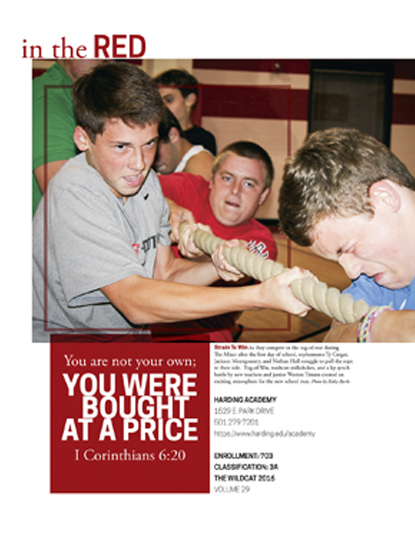 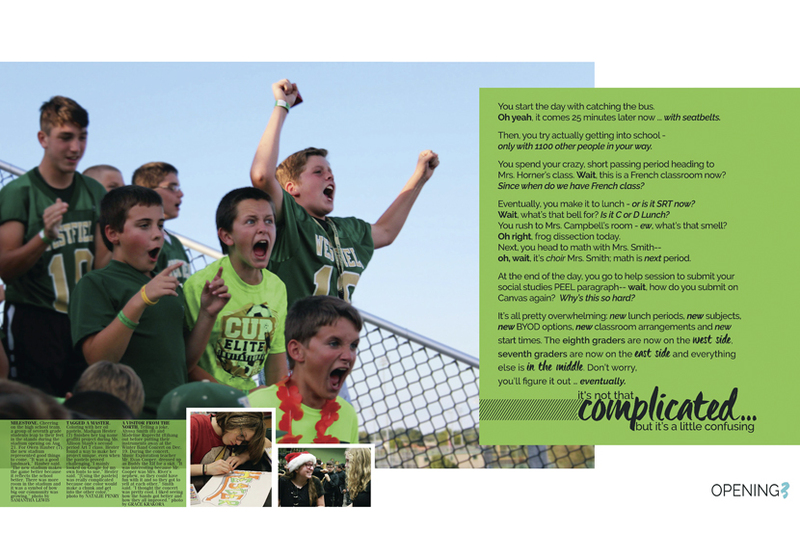 On the opening pages, the book immediately connects the theme phrase and a business operating with too much debt, explaining, “our immense debt allows us to live a more gracious, humble, and thankful life.” The theme is maintained over the next several spreads, with students from the private Christian school expressing gratitude for the debt they owe to the school and their families. 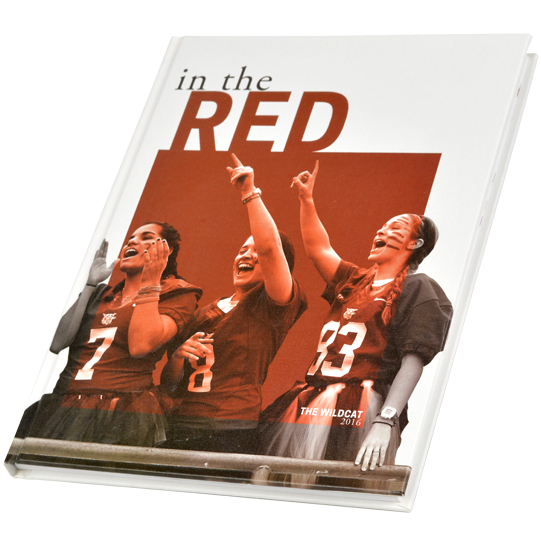 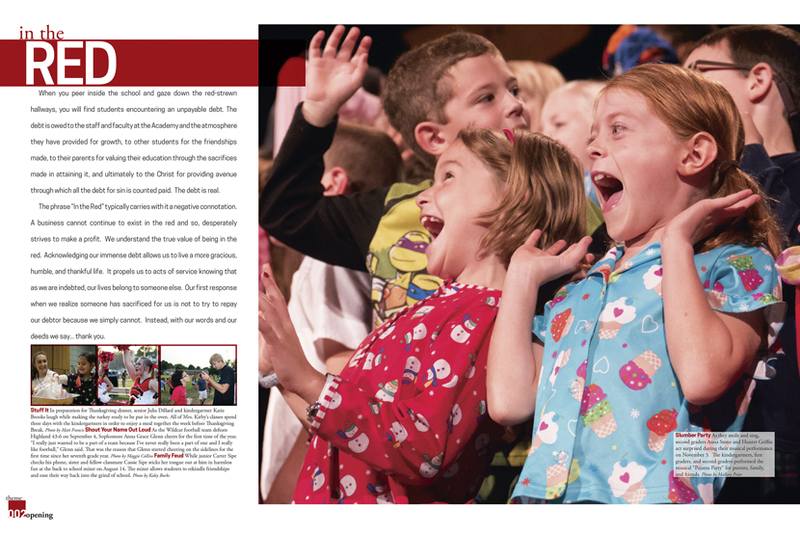 The school’s color red can be spotted throughout the book, beautifully adding splashes of color on divider pages and in headlines. 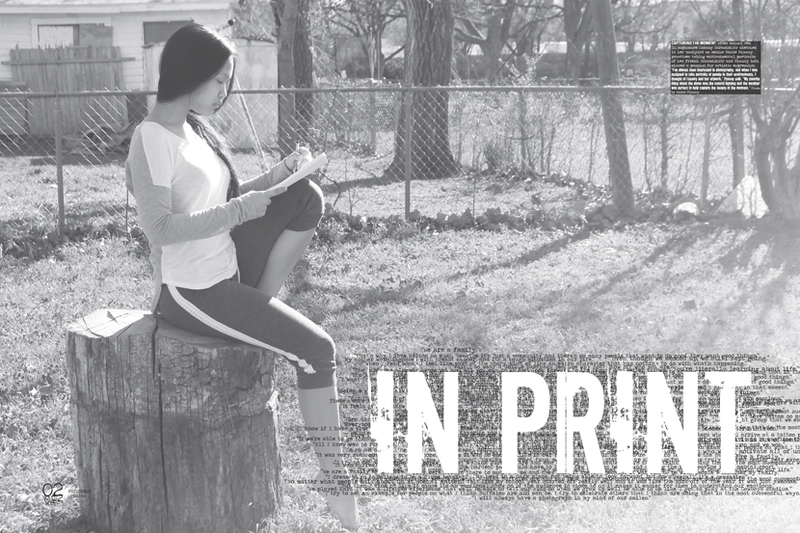 Sometimes it takes a moment to process new information. 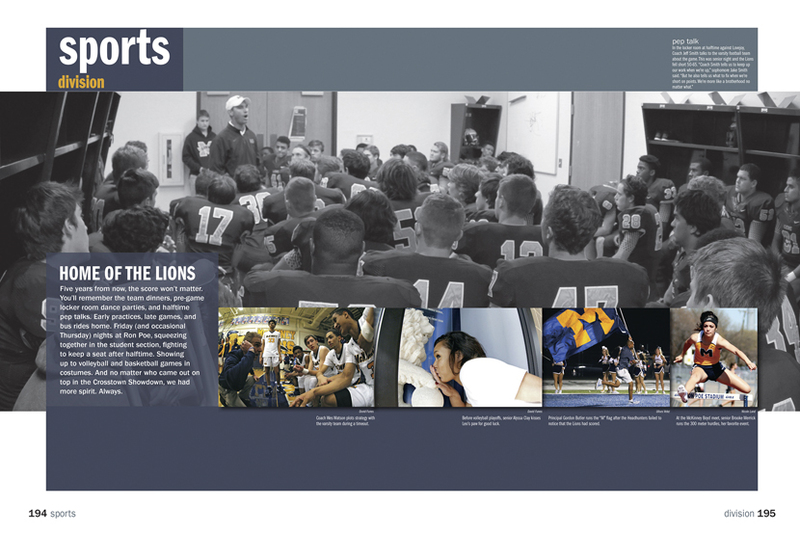 At Arrowhead Christian Academy, there was a new dean, new coaches and athletic director, a new tardy policy, and teachers switched rooms after the middle school moved out of the building. 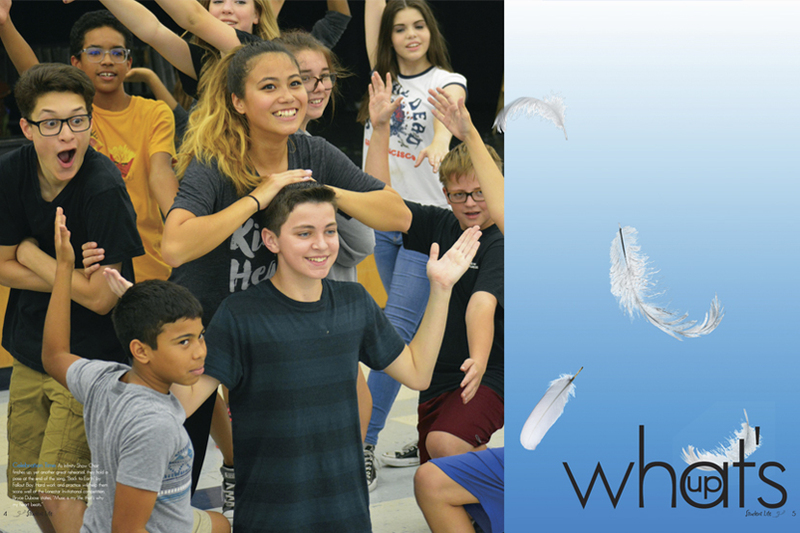 So the 2016 Wings theme “wait, what?” captured the feelings of students as they adjusted to the changes. 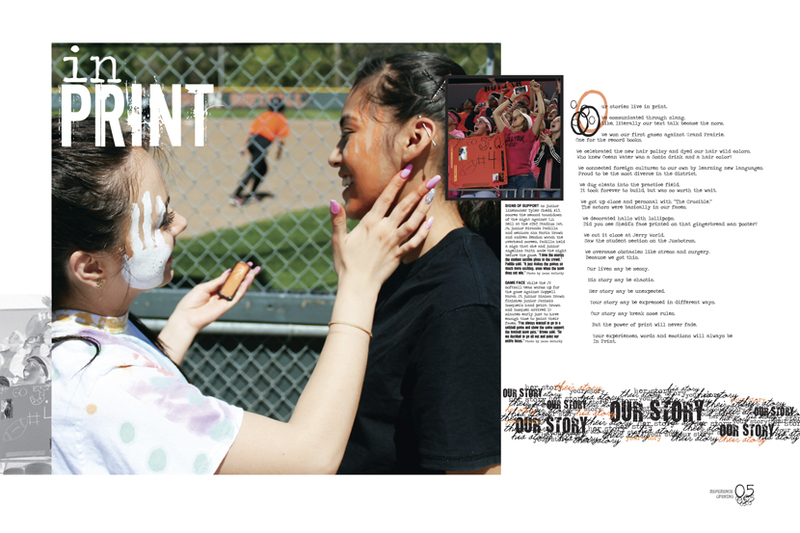 A muted, textured color palette, paint splatters and a mixture of fonts accented spreads that tell stories from the students’ perspective. 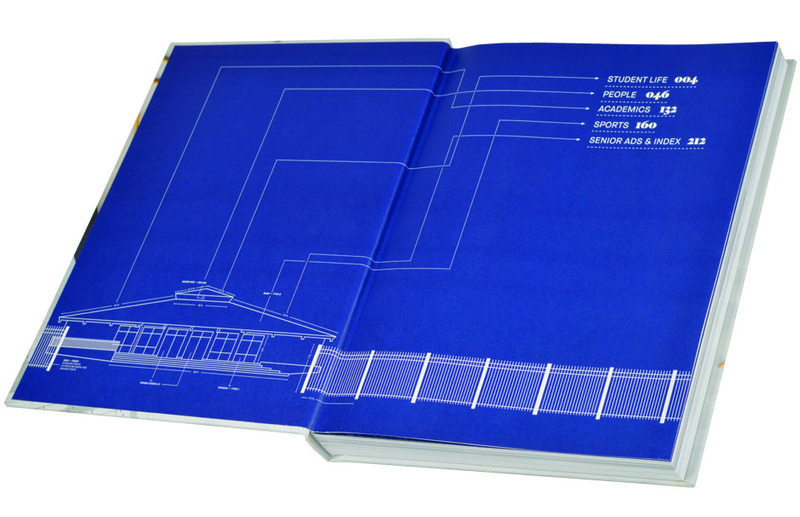 Photos were framed with textured lines and angles, an element that began on the cover. 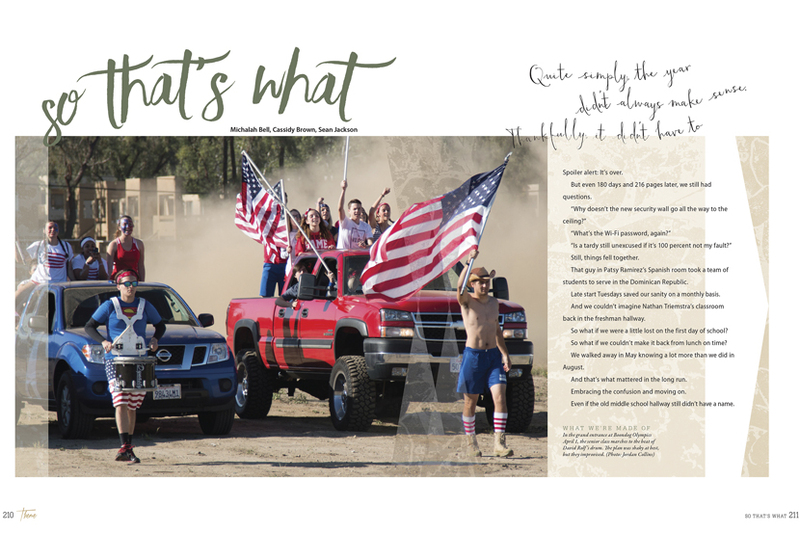 Using a relatable theme made it easy for the staff to focus on the changes in the school and what mattered during the year. 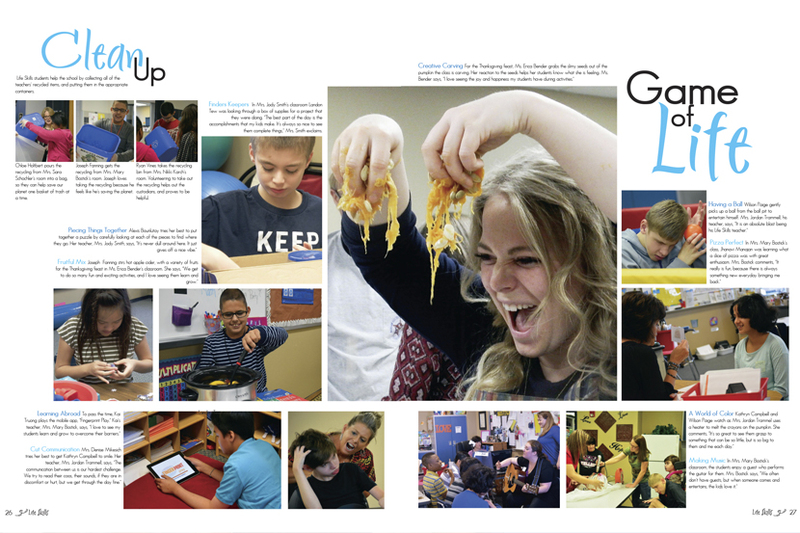 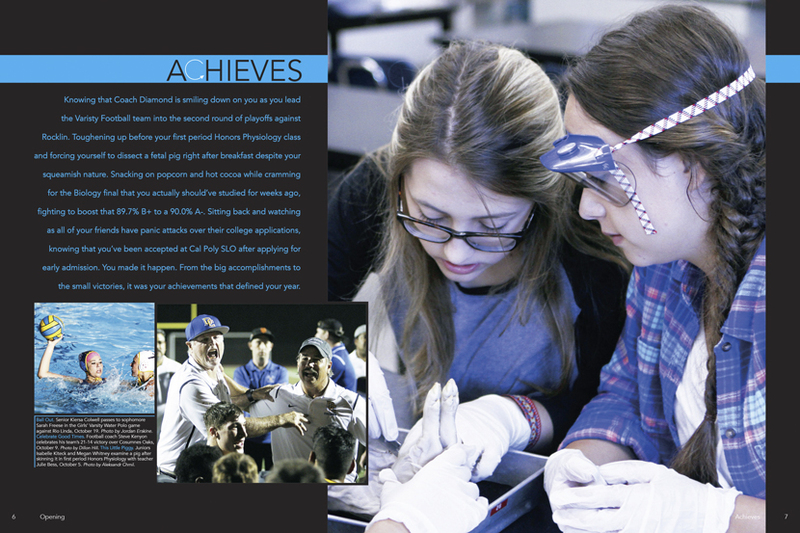 The yearbook staff at Rye High School believed that even though there are guidelines and limitations, each student can strive above and beyond to achieve their goals. 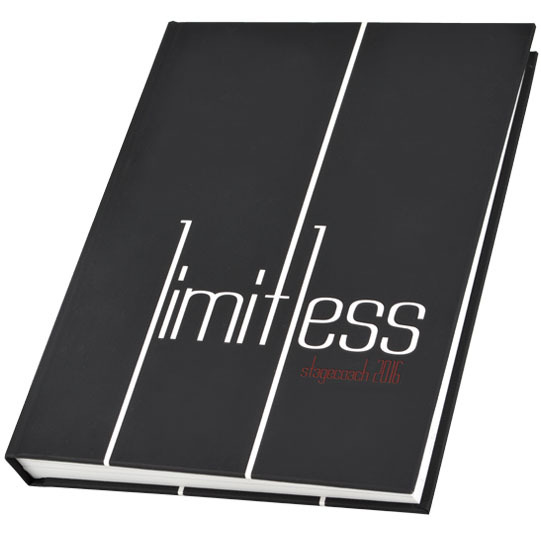 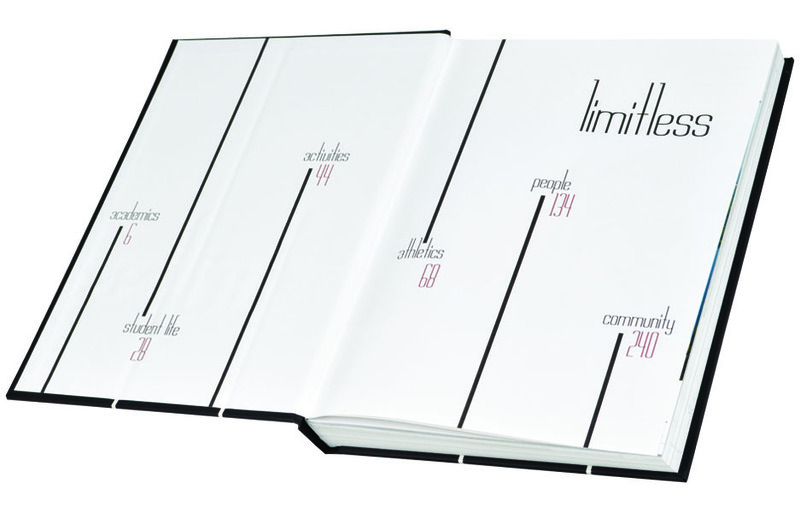 Along with the “Limitless” theme word, the unending lines on the cover and throughout the book represent how unstoppable the students are, according to the colophon. 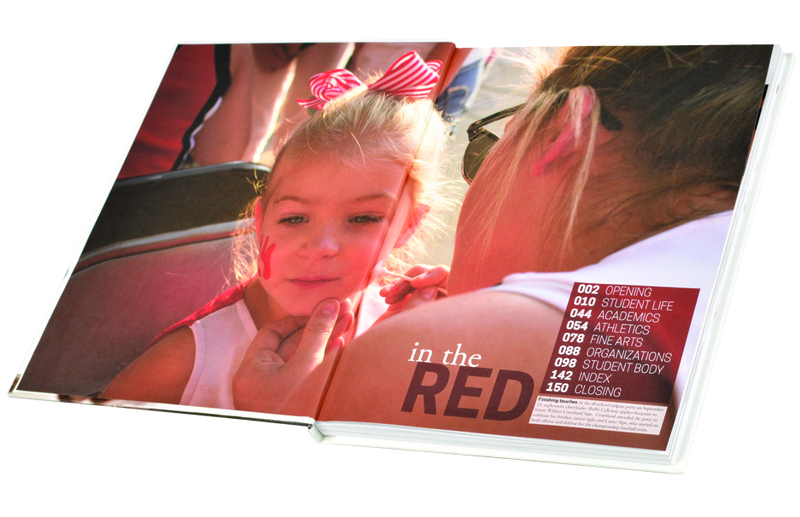 Spread design stayed true to the simple cover design, and the use of the school colors of garnet and black were a nod to this 90th edition of the Stagecoach. 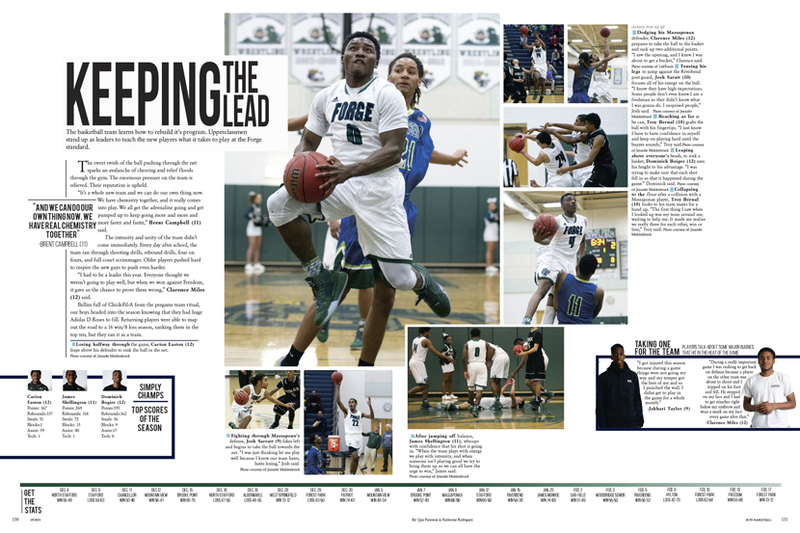 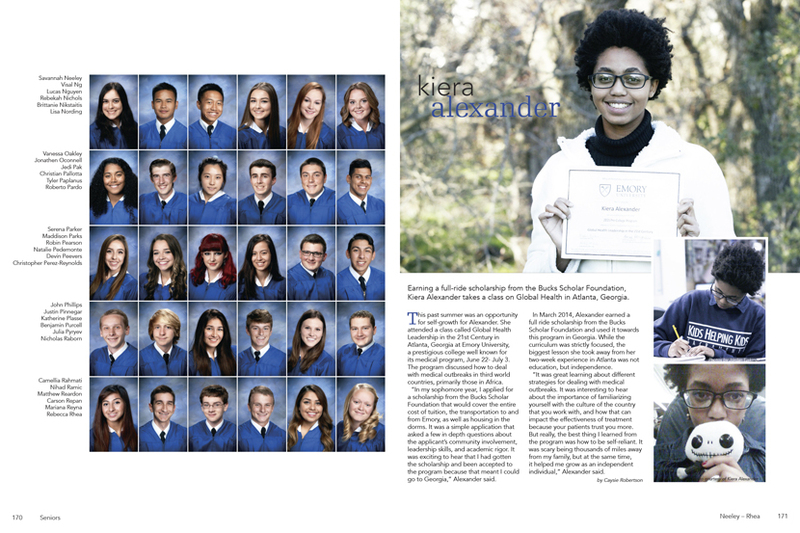 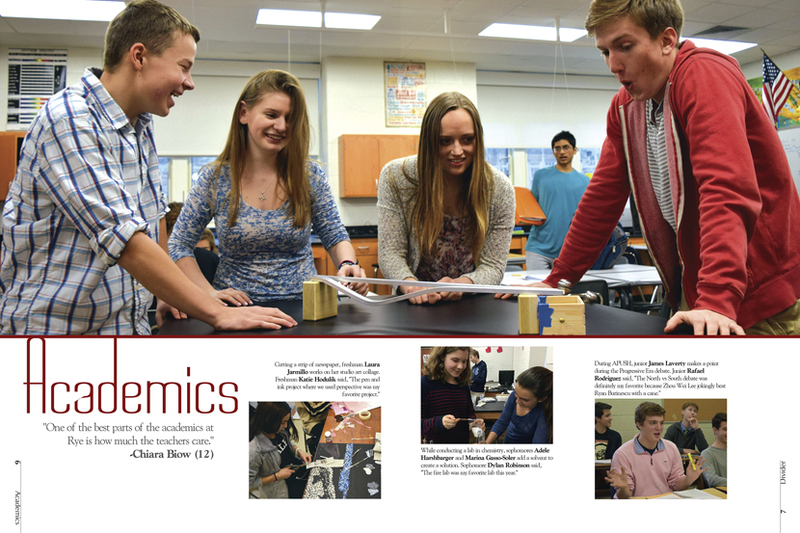 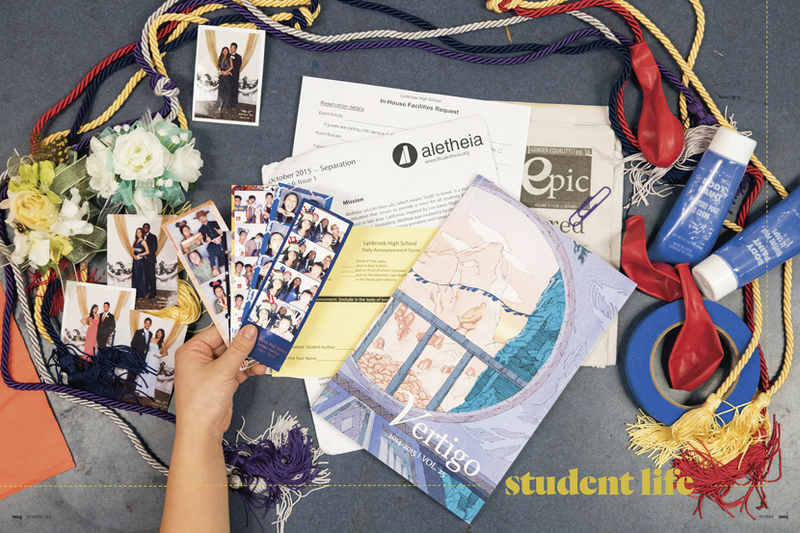 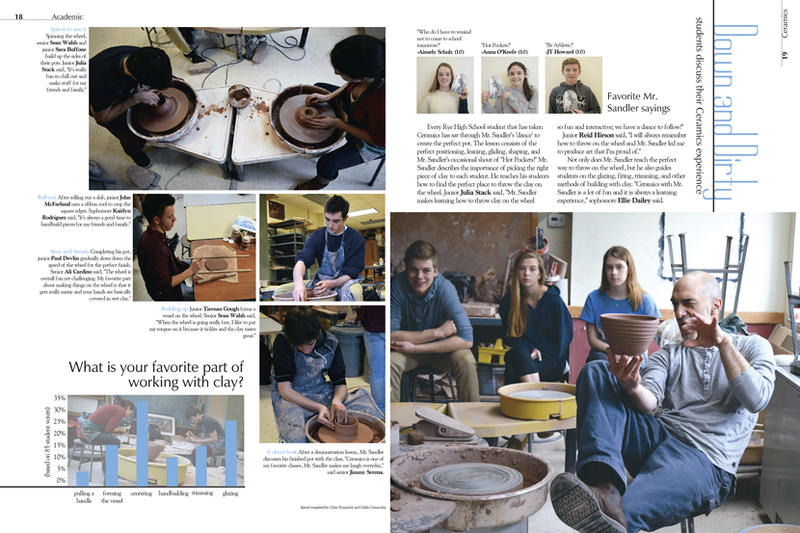 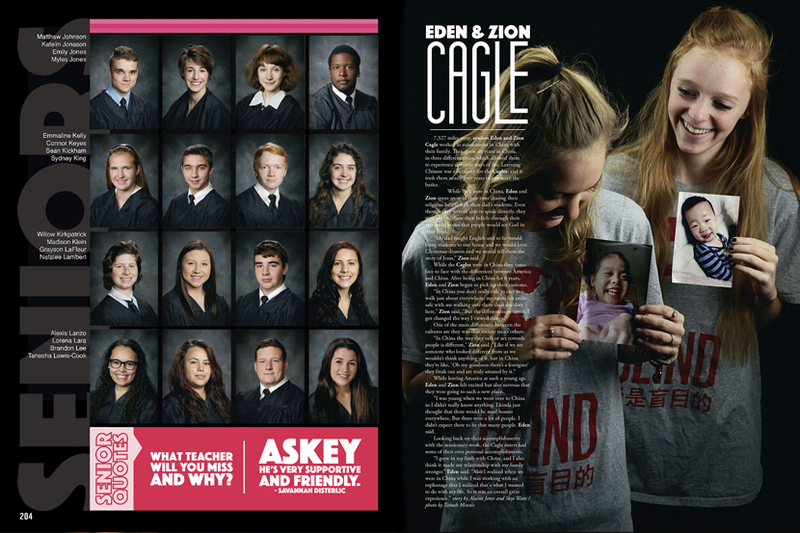 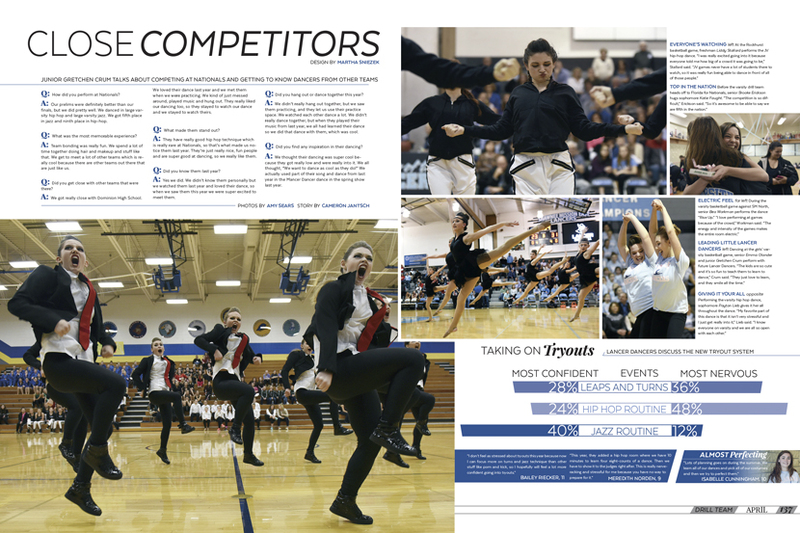 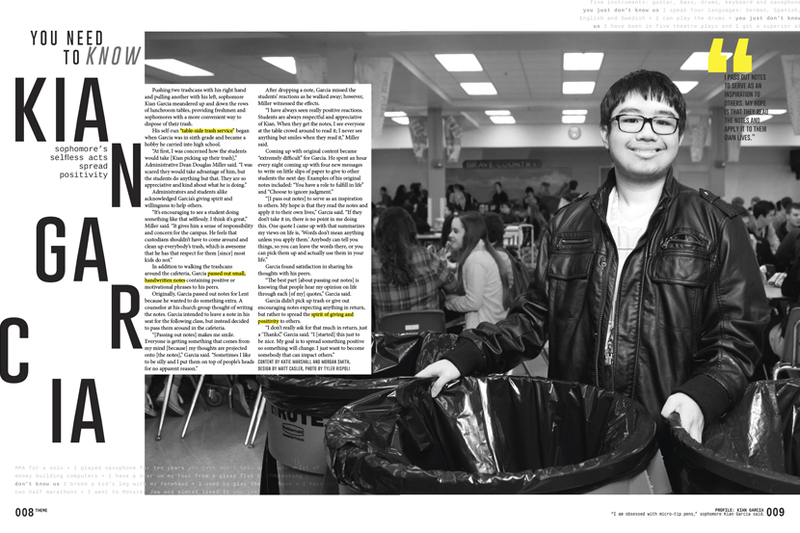 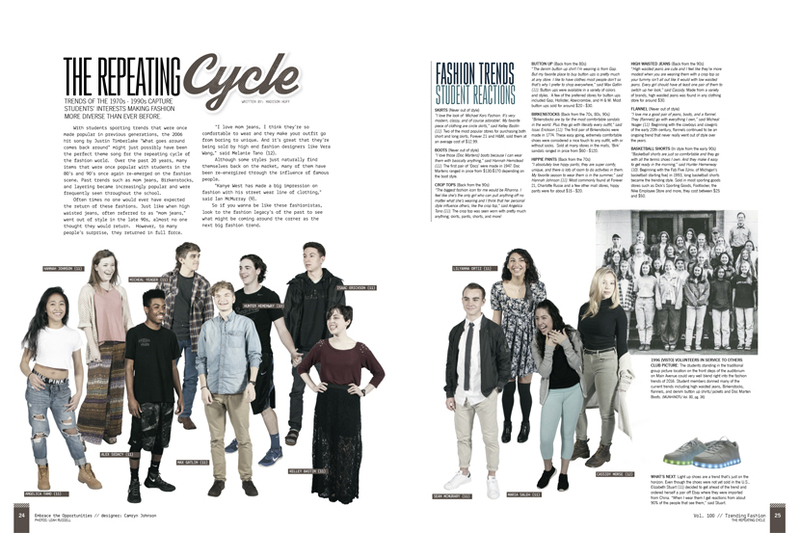 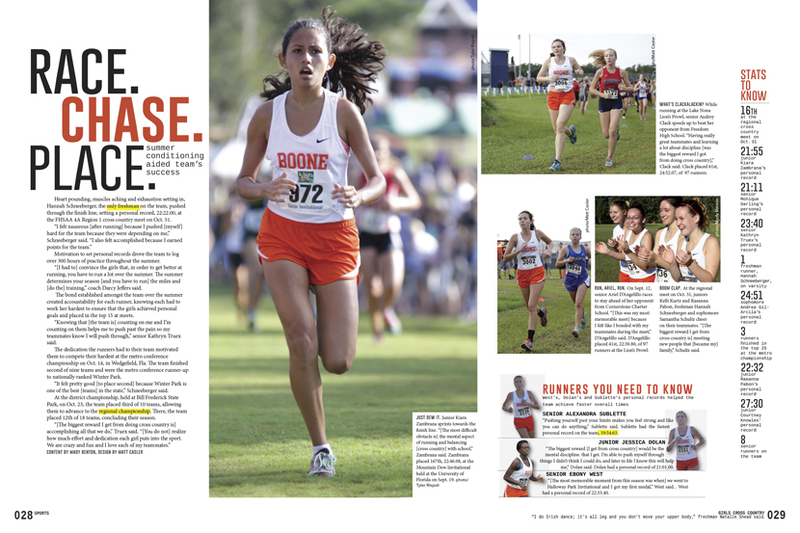 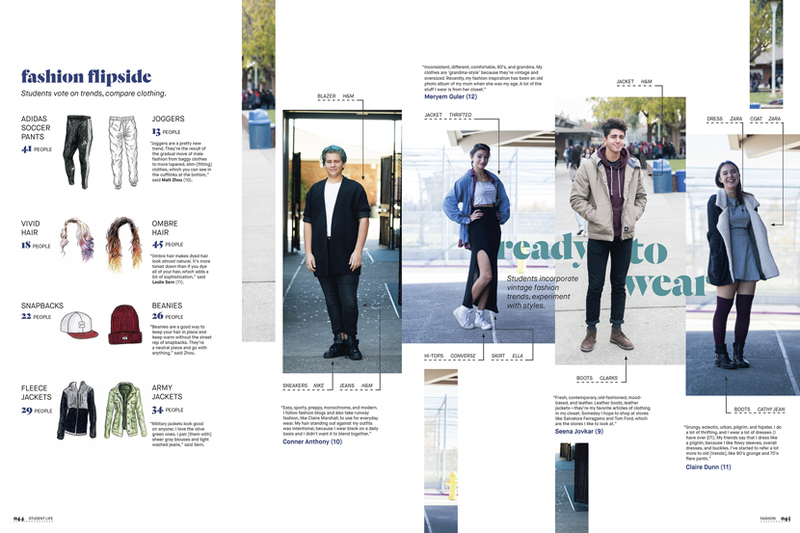 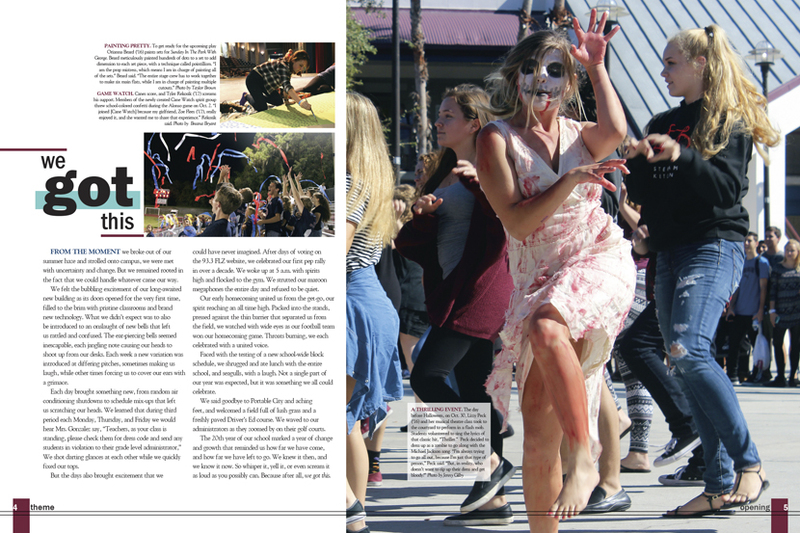 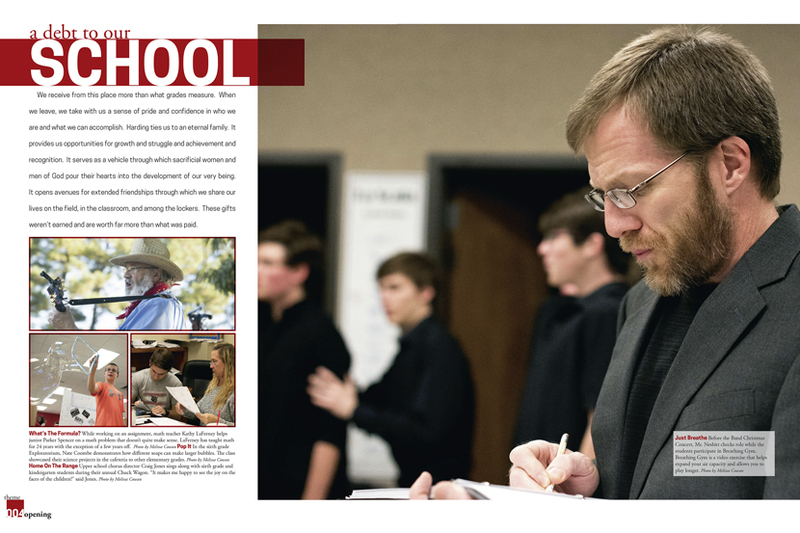 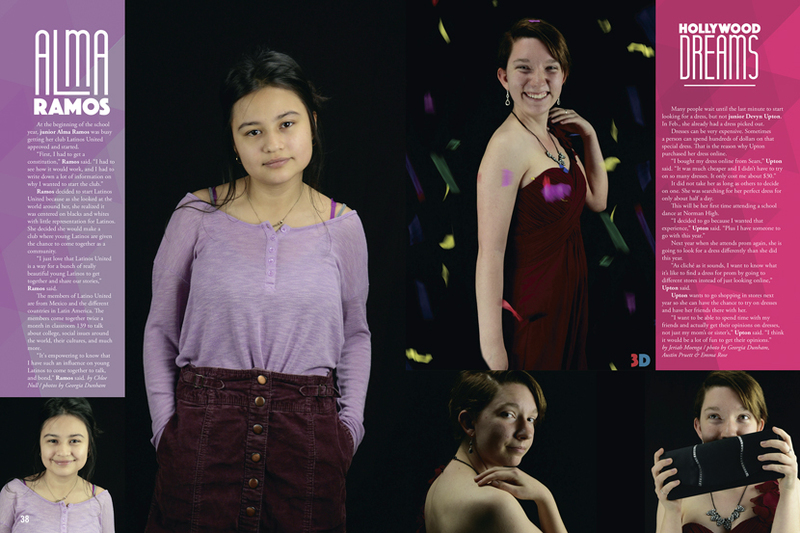 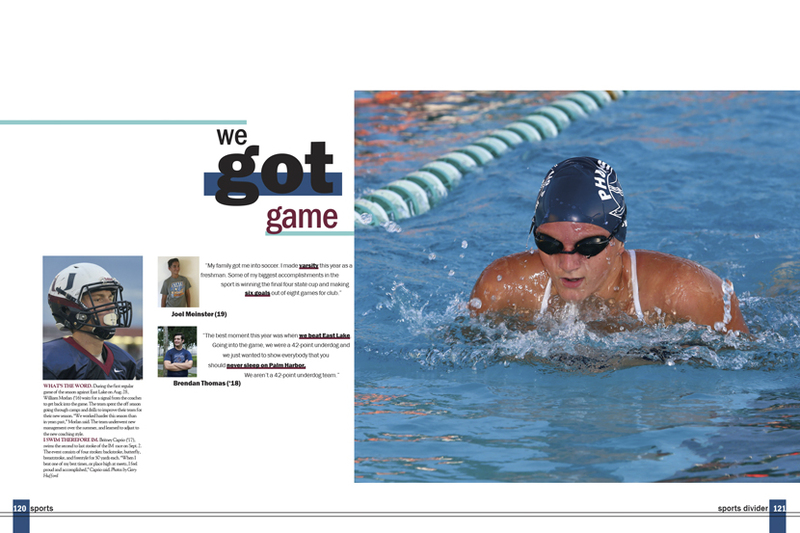 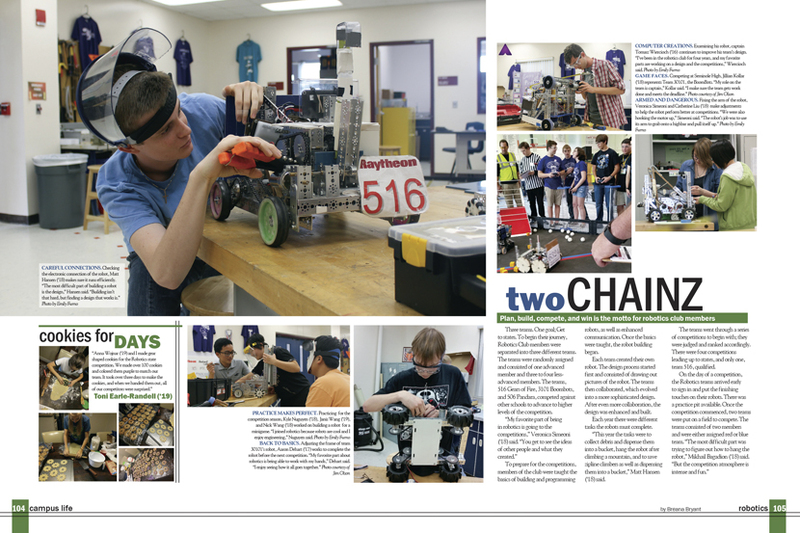 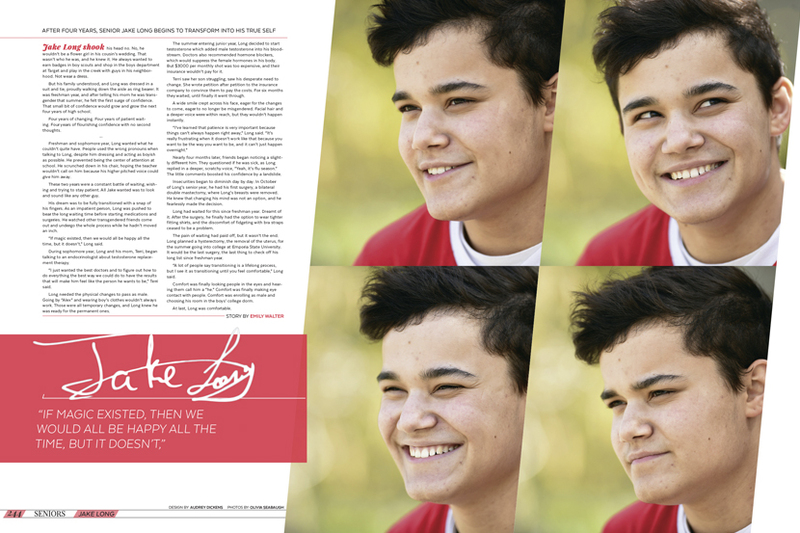 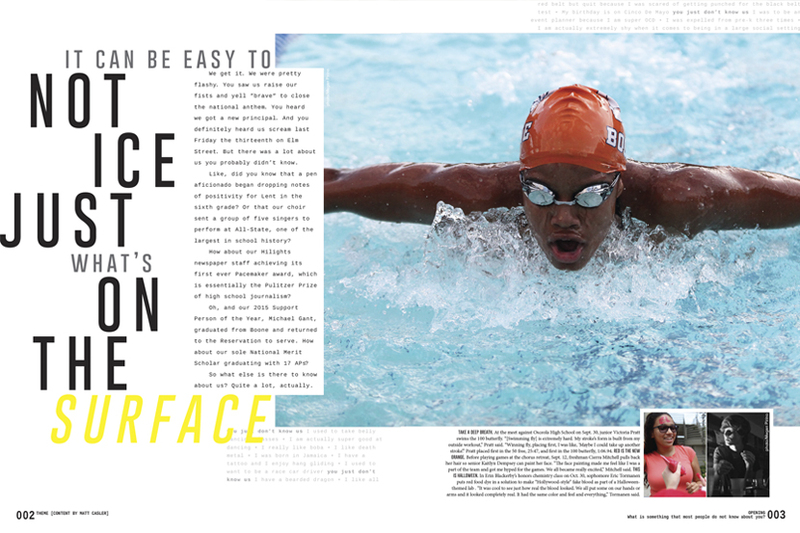 In addition to interesting coverage angles of what students did and achieved during the year, each section included a profile of a student who pushed the limits, using a large dominant photo that bleeds off the spread. 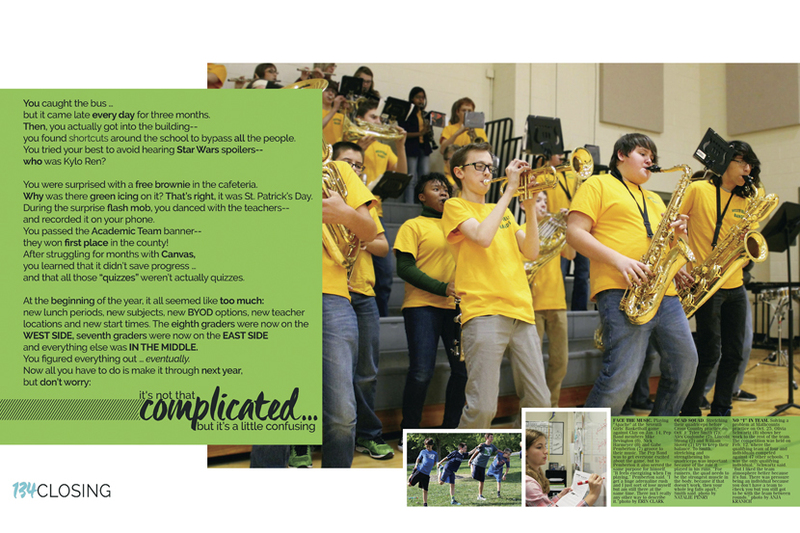 Theme: "It's not that complicated... but it's a little confusing"
The students at Westfield Middle School faced lots of little changes in 2015-16. 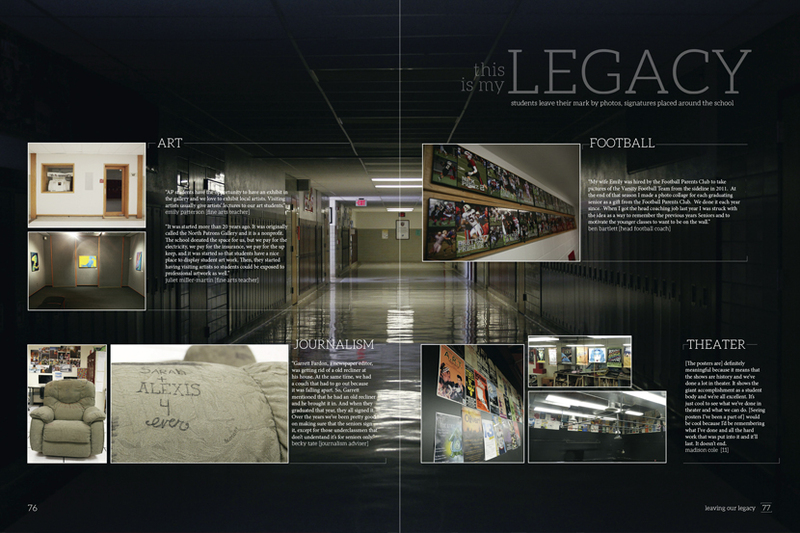 The 7th and 8th grade classes moved to different sides of the building. 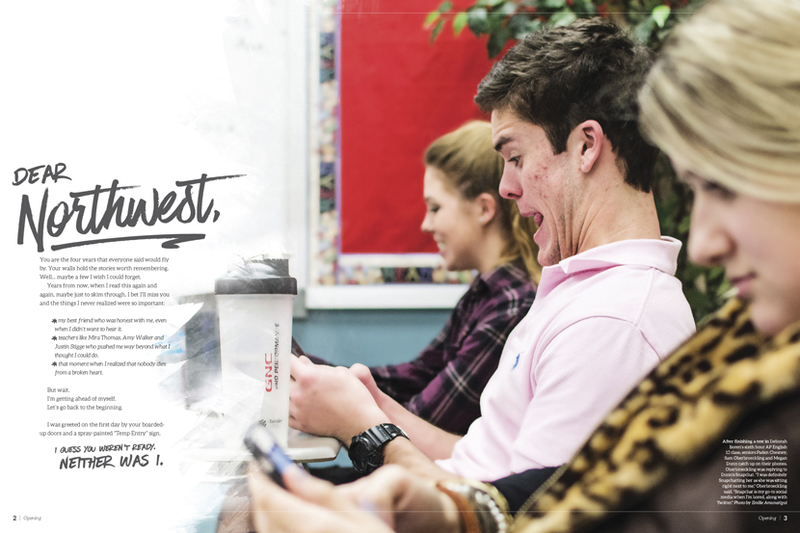 School started 25 minutes later. 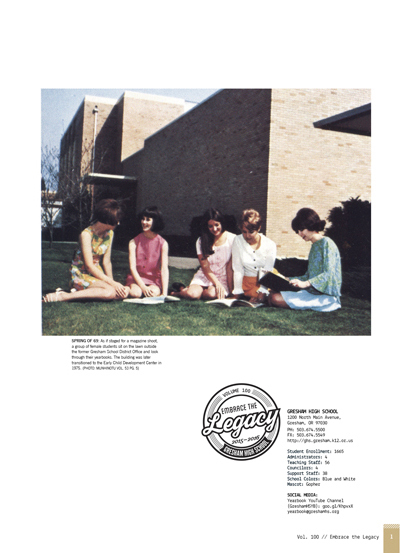 An extra lunch period was added to the schedule. 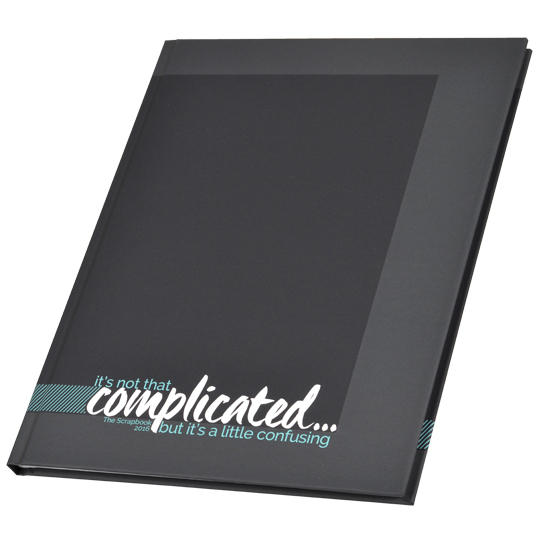 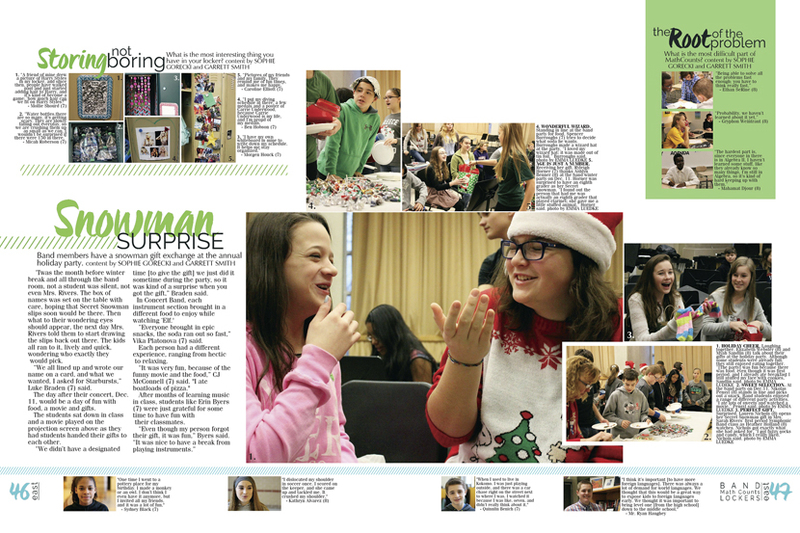 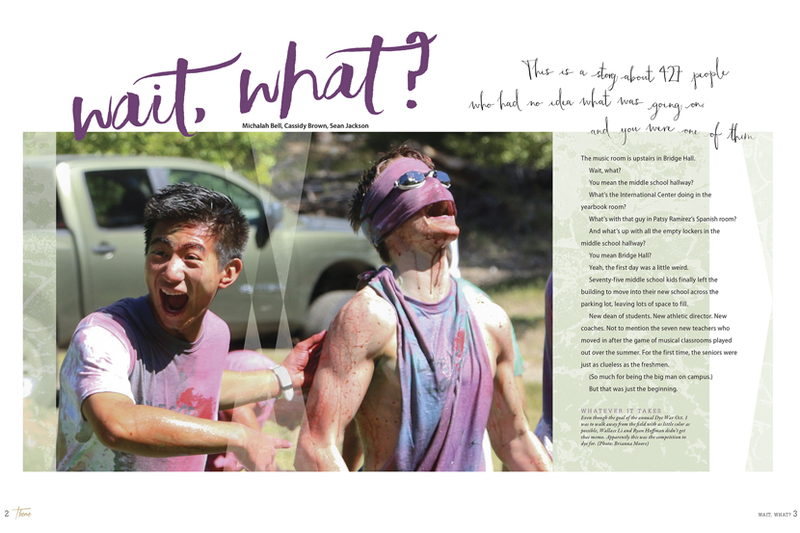 When the 2016 Scrapbook staff set out to chronicle the year, the playful theme “It’s not that complicated… but it’s a little confusing” was perfect. 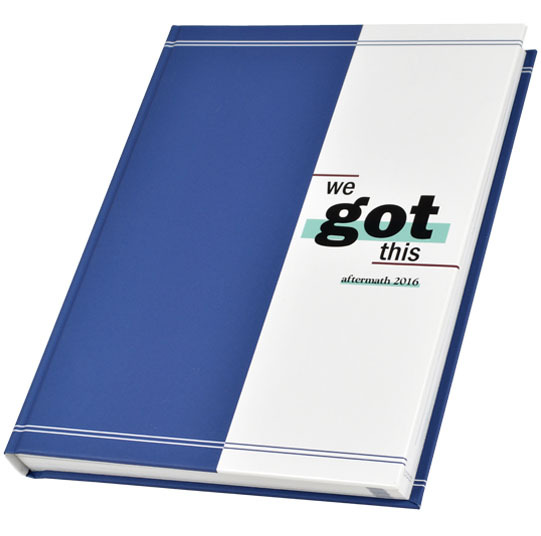 In a fun, yet still exasperated, tone the opening copy ticks through the year’s stressful changes before resolving, “Don’t worry, you’ll figure it out… eventually.” Then the book proceeds to show just how Westfield students did figure it all out during another memorable year. 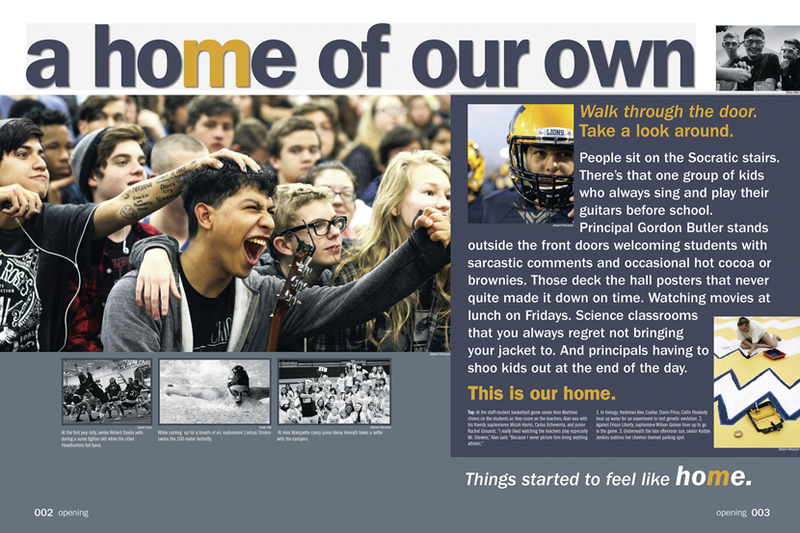 For the four years (and many hours) that students spend in high school, the surroundings really do start to feel like a second home. 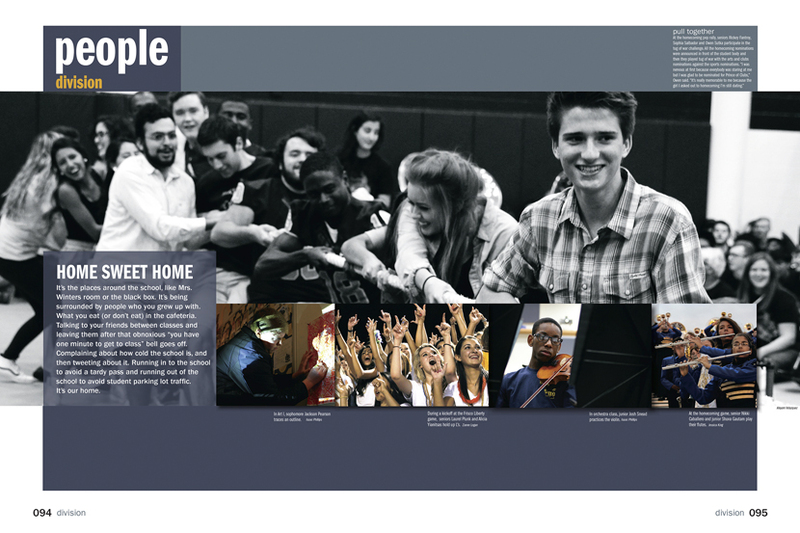 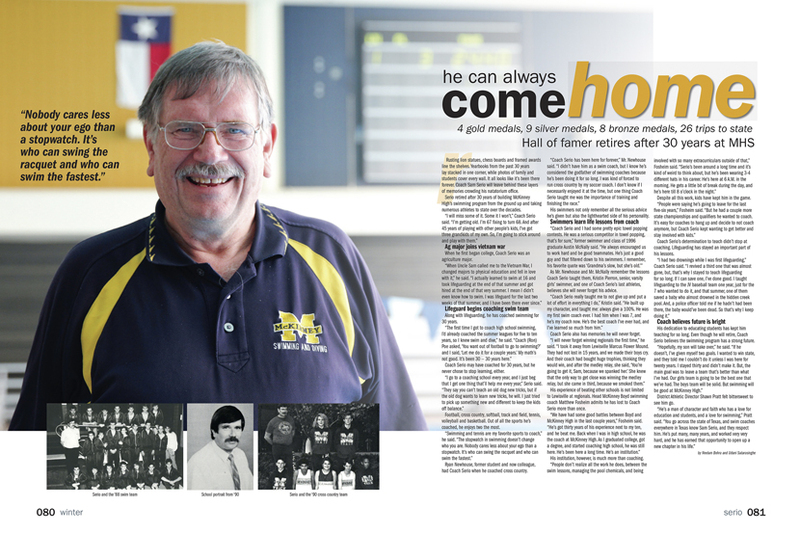 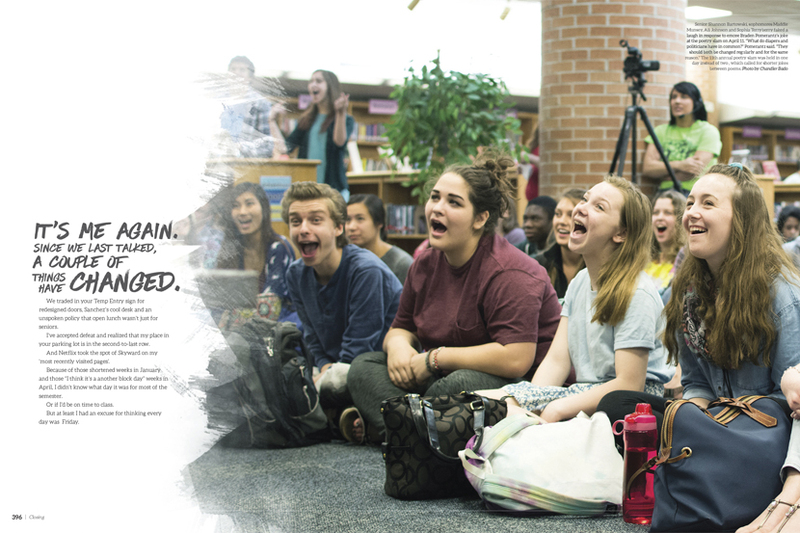 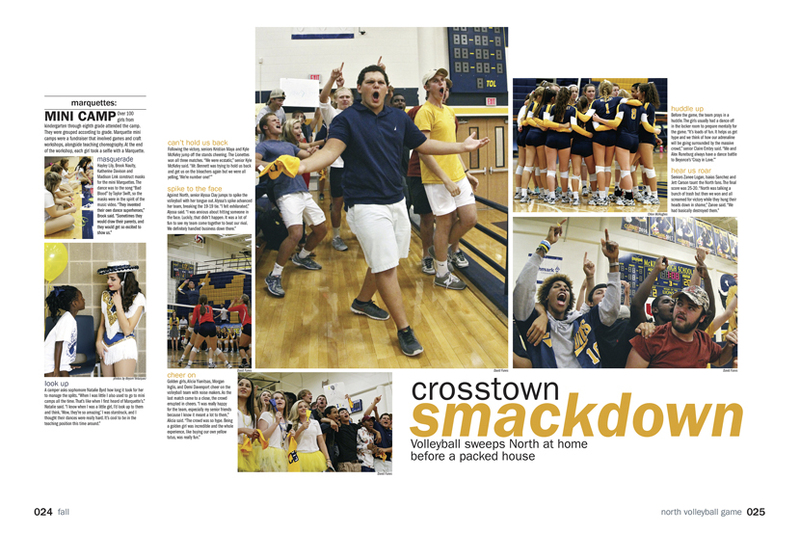 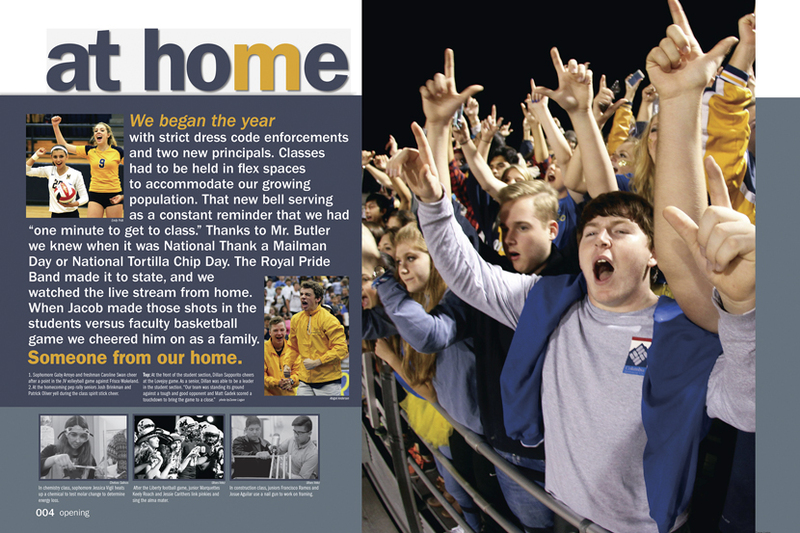 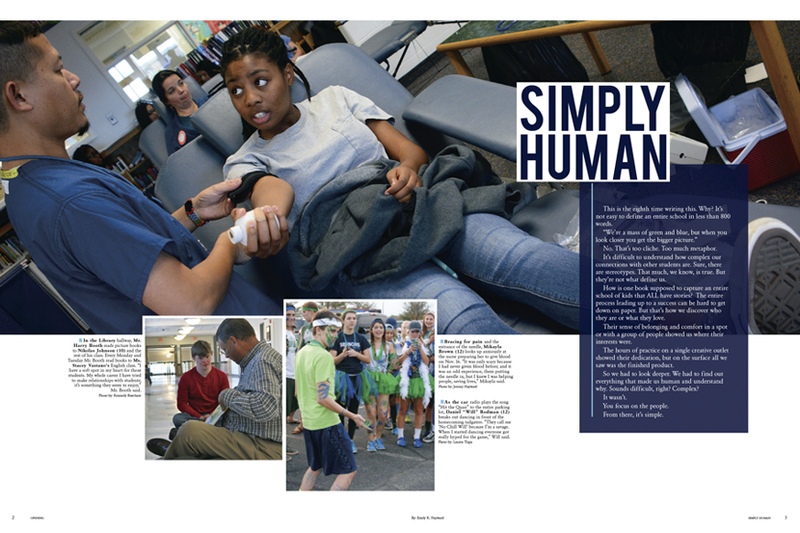 The McKinney yearbook staff tapped into those feelings with their theme in the 2016 edition of The Lion. 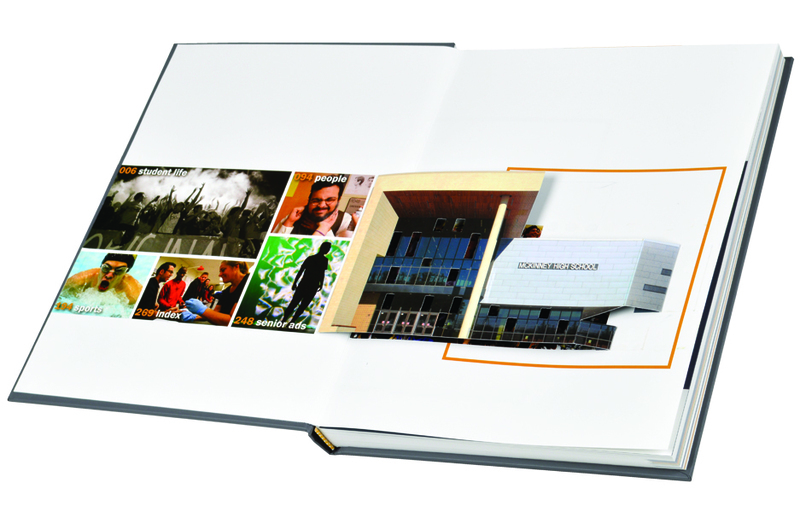 Sculpture embossed and fun pop-up versions of the school building appear on the cover and front endsheet, letting you know right away how McKinney students feel about their “home.” The book’s opening pages and division pages incorporate the theme word and include photos of students and teachers in memorable moments or in their comfort zones. 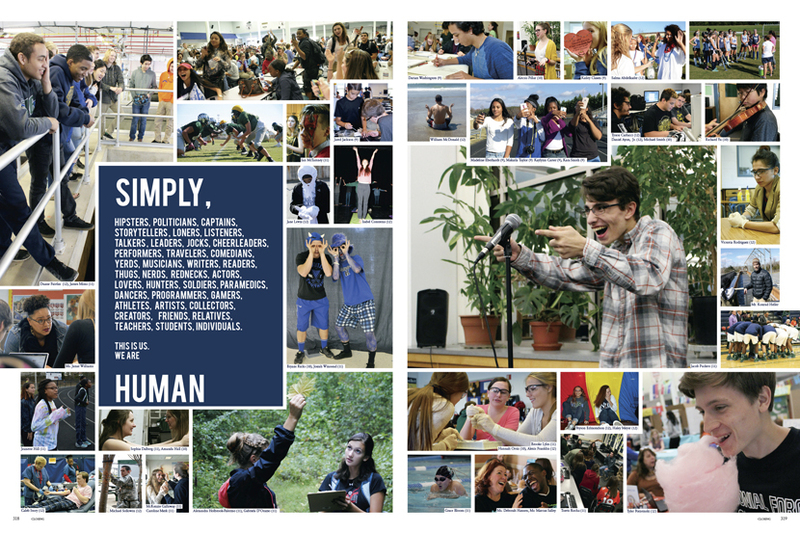 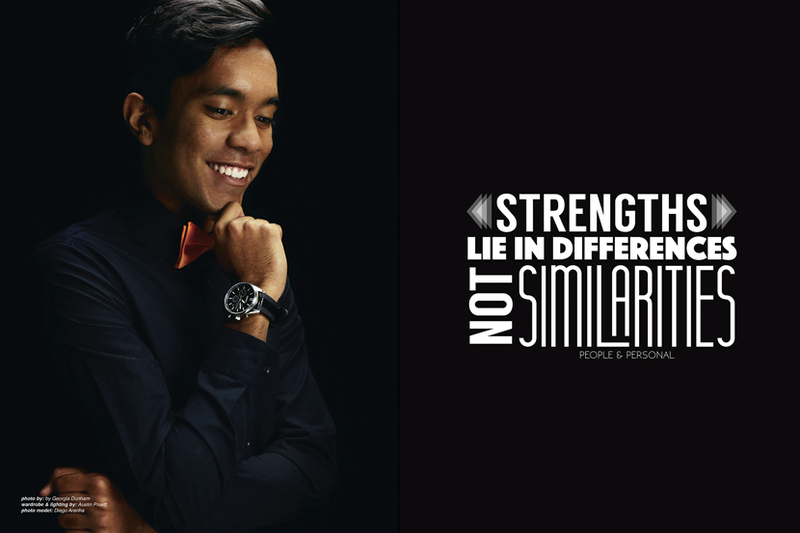 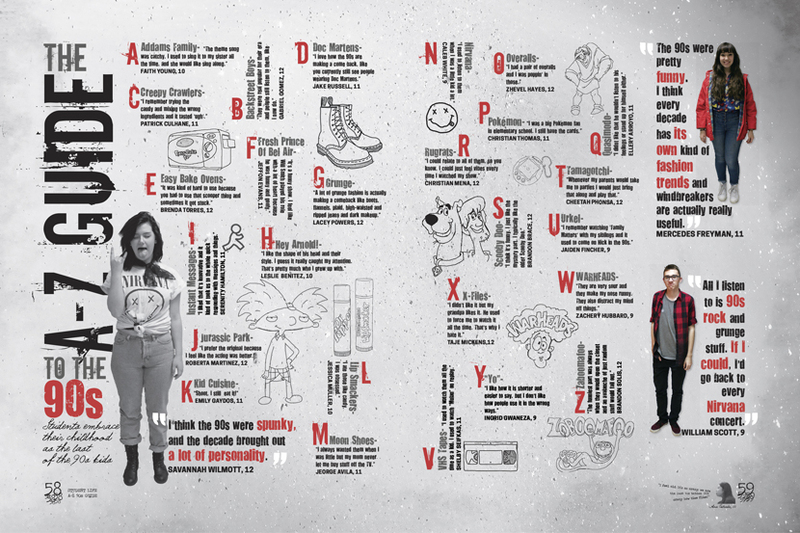 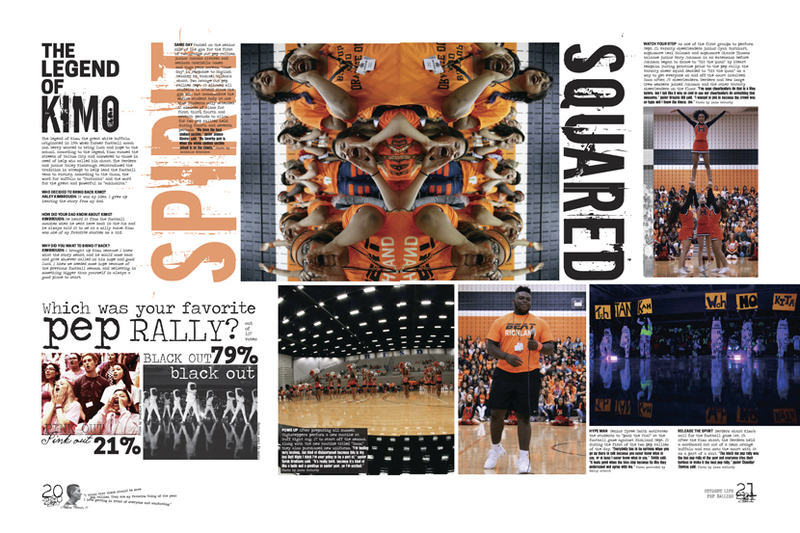 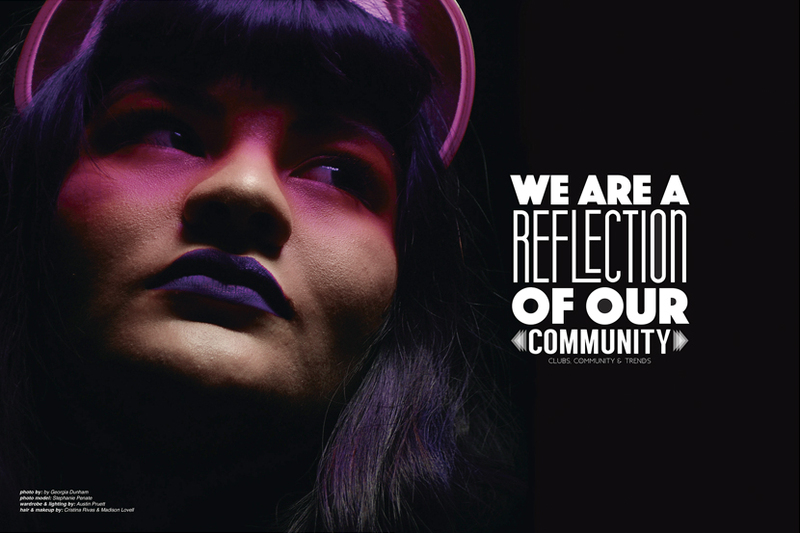 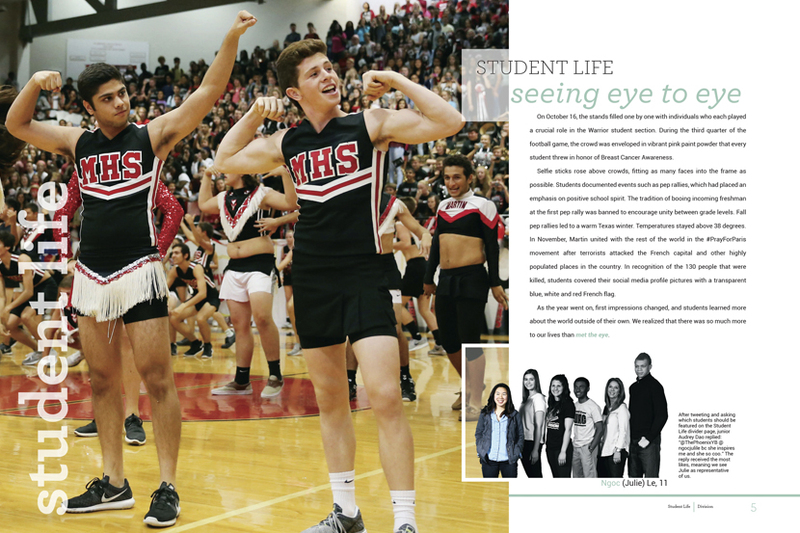 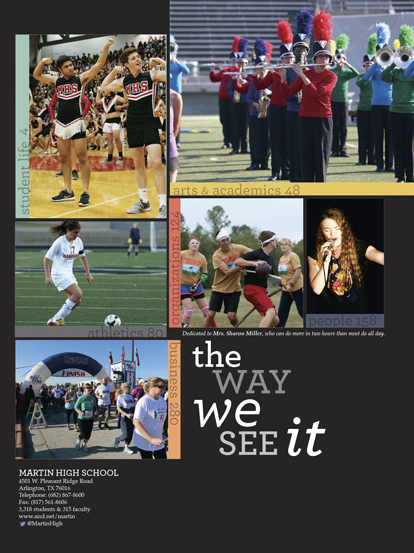 Theme: "The way we see it"
A yearbook should be from the point of view of the students. 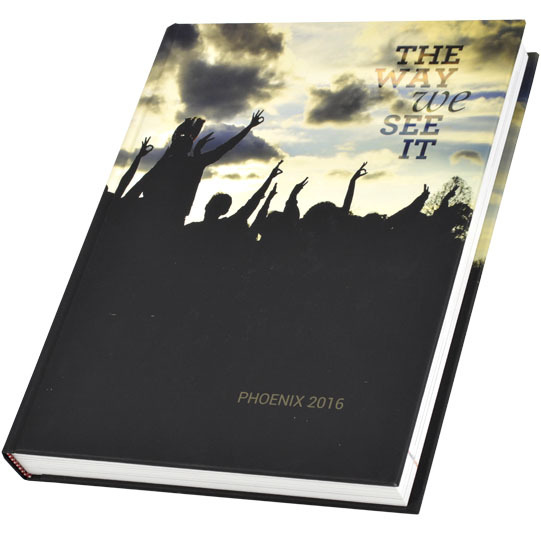 The way the students at Martin High see their school begins on the cover of the 2016 Phoenix, with silhouettes of students holding up the warrior hand sign. 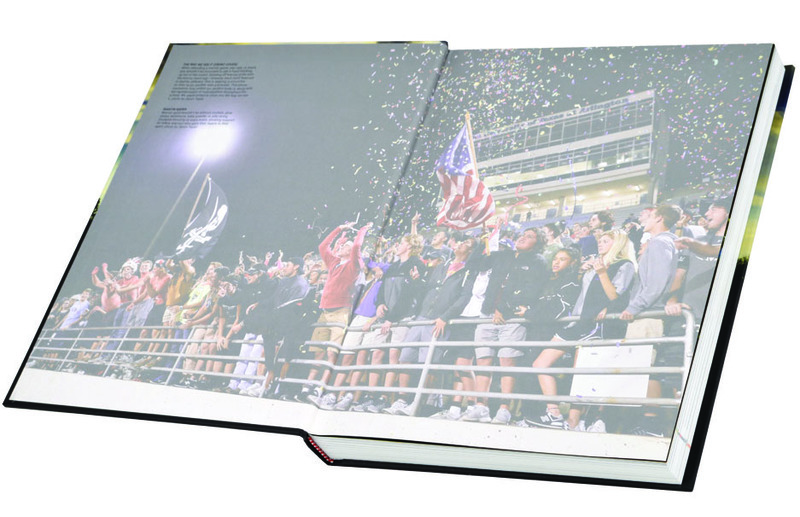 The table of contents is on the title page, leaving the front endsheets open for a large image of enthusiastic football fans and captions for the cover and the image that introduce the verbal theme. 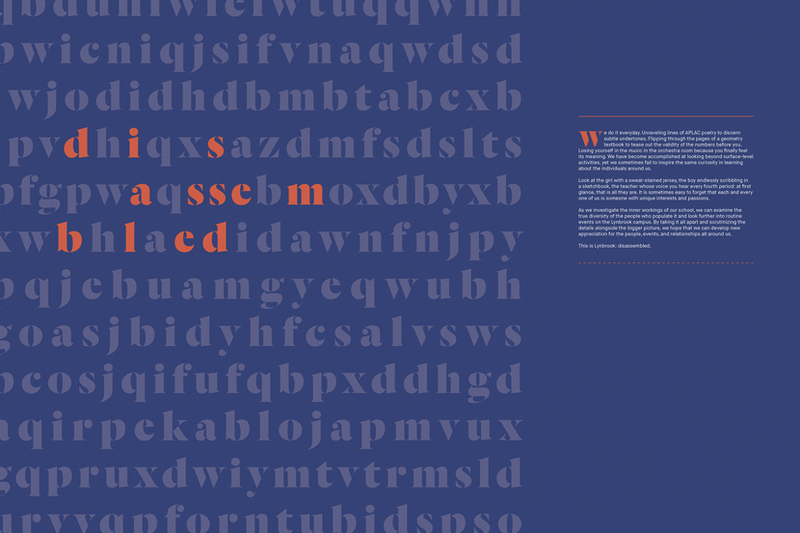 Each section has its own theme color, and a combination of the Archer, Roboto and Palatino fonts pull readers into the copy. 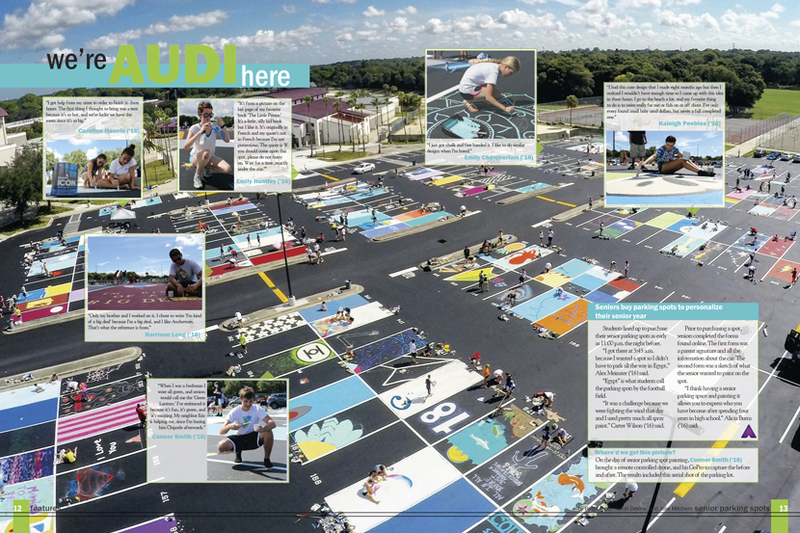 The staff’s Go-Pro and drone gave them new perspectives on their school, and the inspiration for their theme. 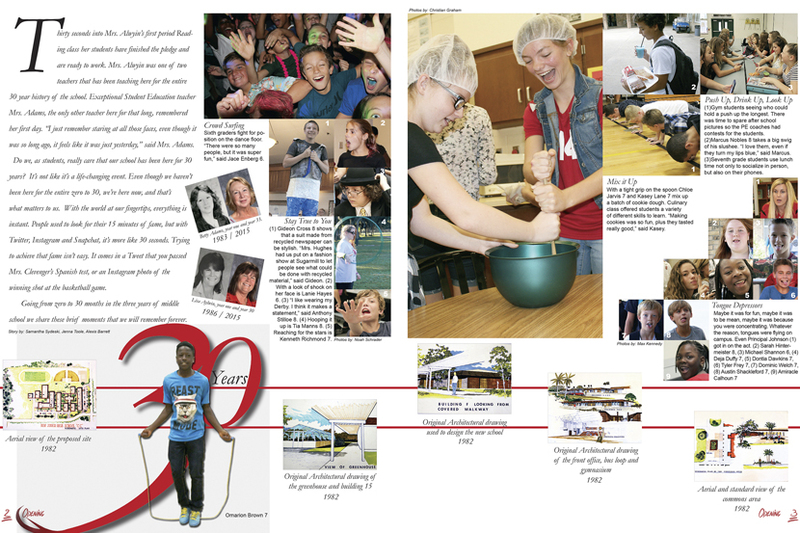 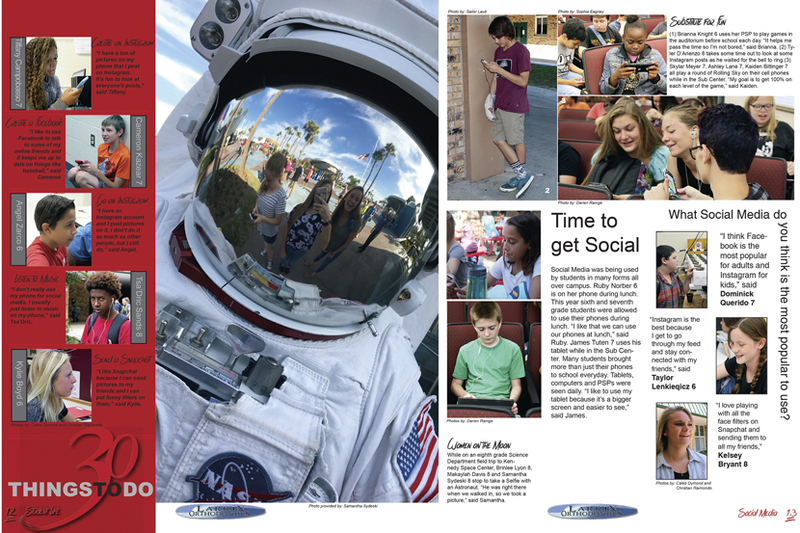 The 2016 yearbook staff at New Smyrna Beach Middle School got the fun of sinking their teeth into an anniversary book, specifically their school’s 30th anniversary yearbook. 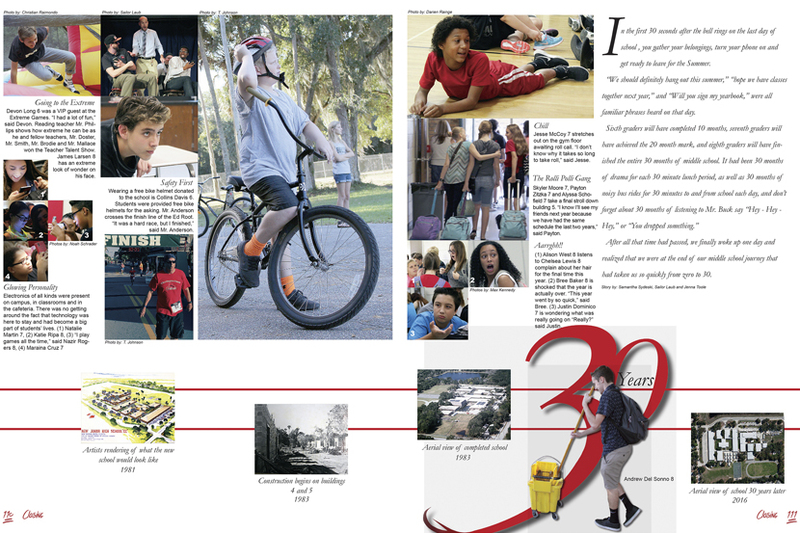 They did so with the theme, “Zero to 30,” which not only represented the number of years their school had been in existence, but also the number of months students spend at New Smyrna during their three years of middle school. 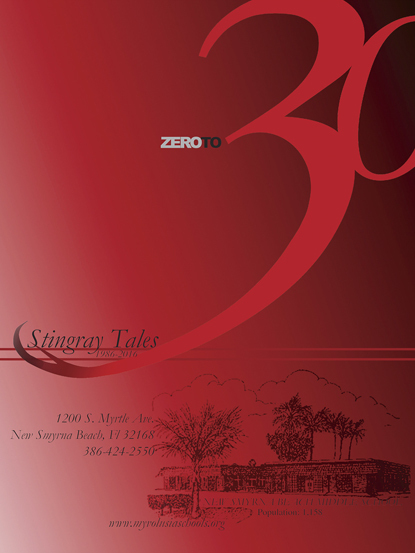 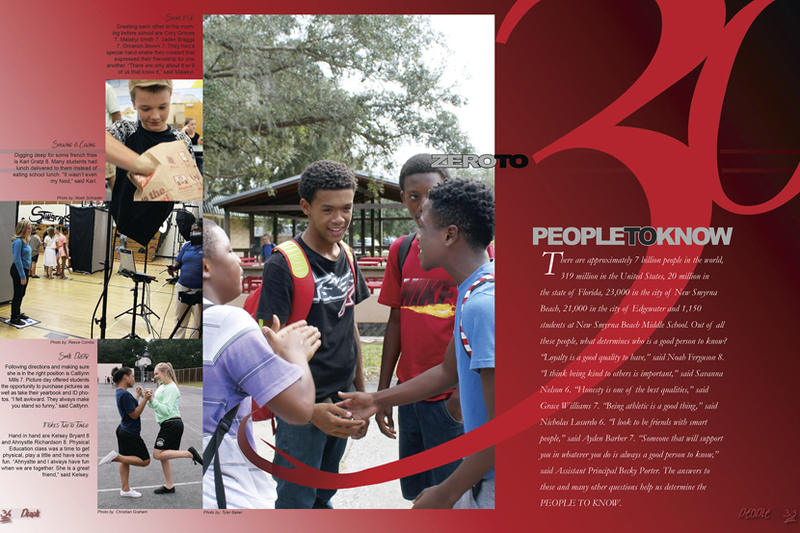 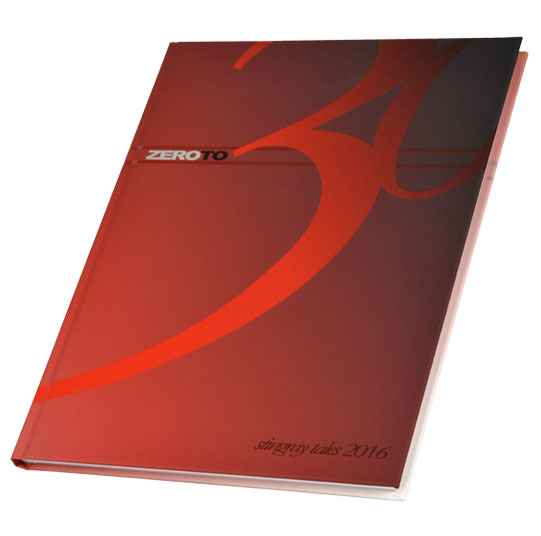 The opening pages tell the reader, “Going from zero to 30 months in the three years of middle school, we share these brief moments that we will remember forever.” The fun treatment given to the theme phrase on the cover is repeated on the division pages, and the number 30 appears in cool sidebars throughout the coverage. 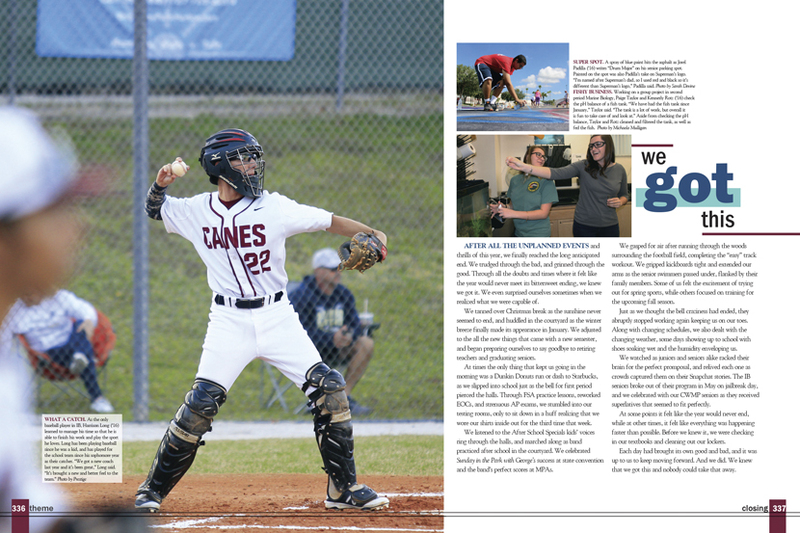 Students faced many changes at Palm Harbor University High School during the 2016 school year, including replacement of portable buildings with additional classrooms in the building and a new block schedule. 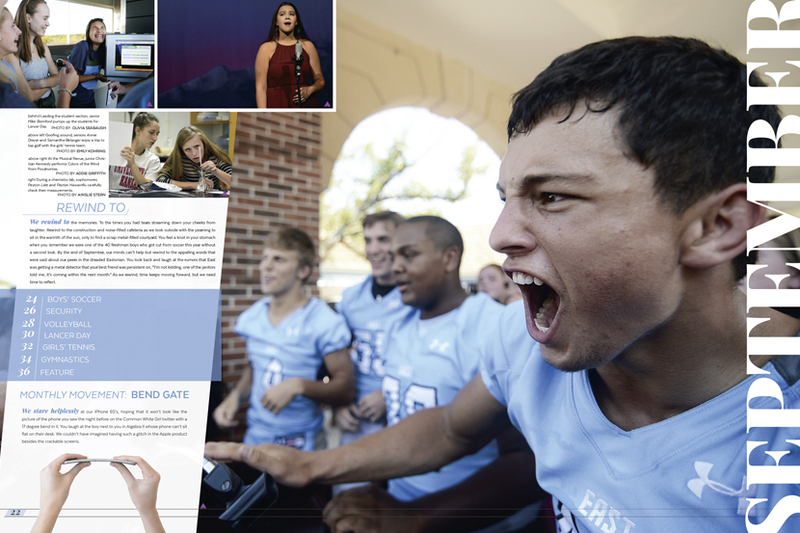 The 2016 Aftermath showed how students handled whatever came their way, whether the situation was good or challenging. 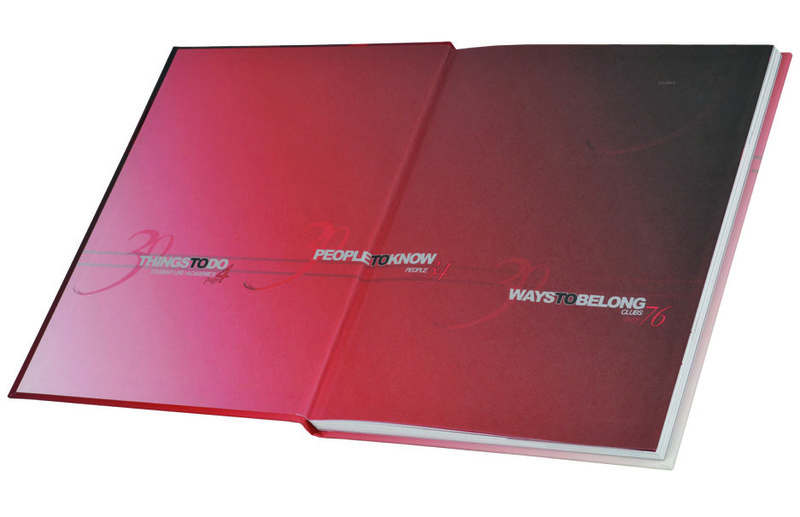 Theme colors of navy and red, which are school colors, and teal, along with the use of lines tied the book together while leaving plenty of room for creativity. 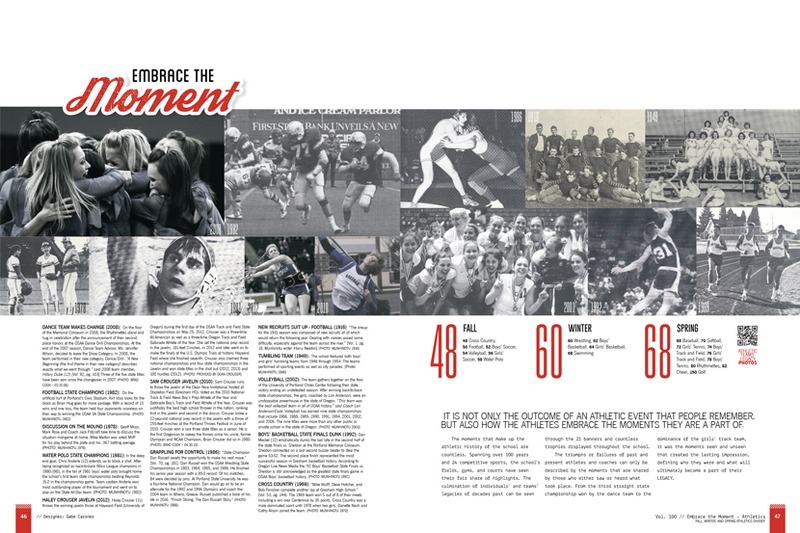 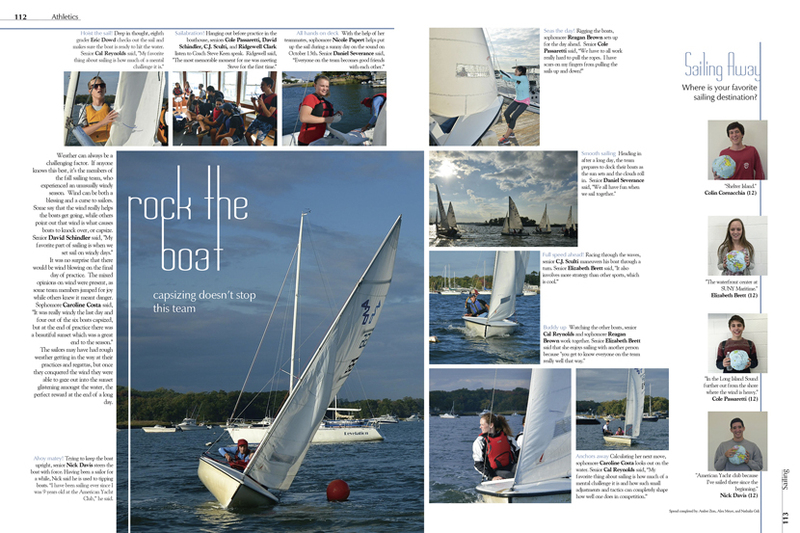 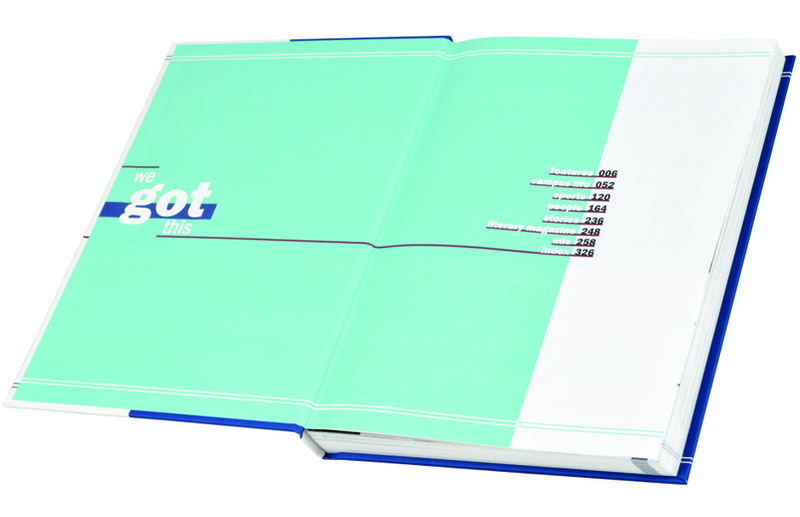 The faux quarterbound on the cover influenced the spread design, giving the book a consistent look. 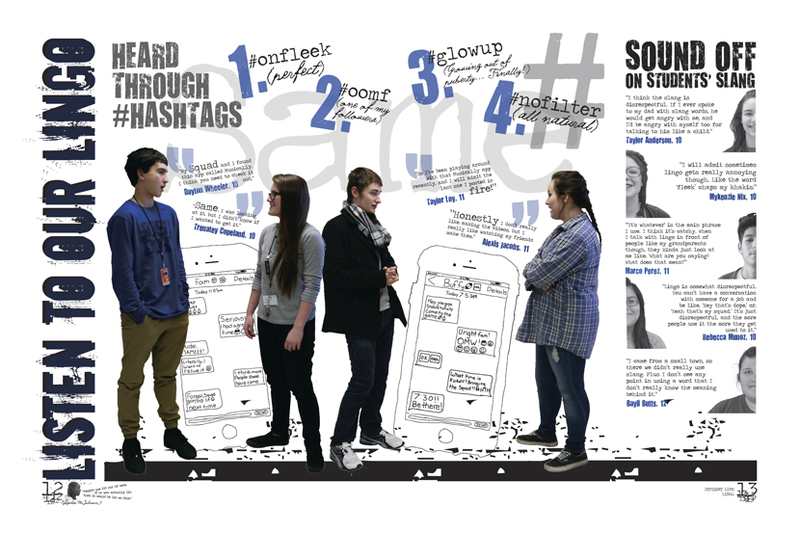 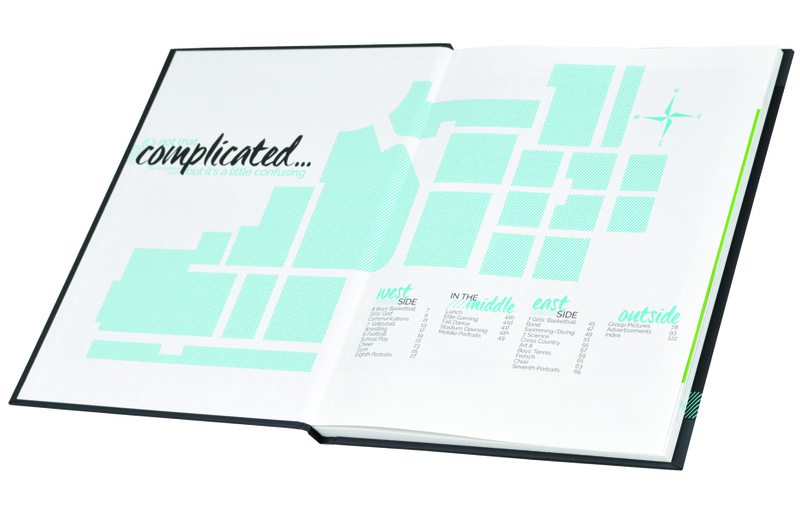 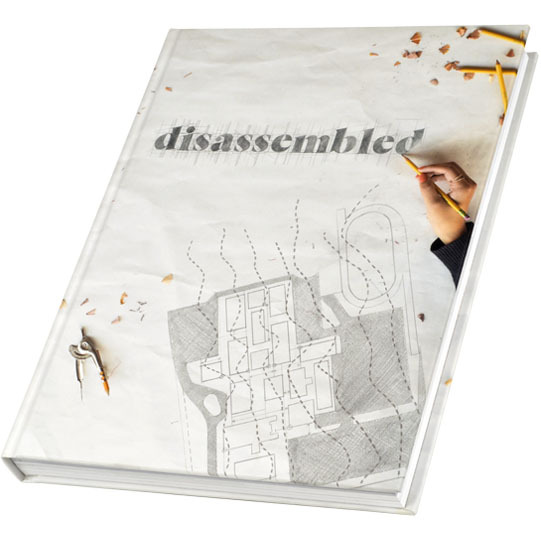 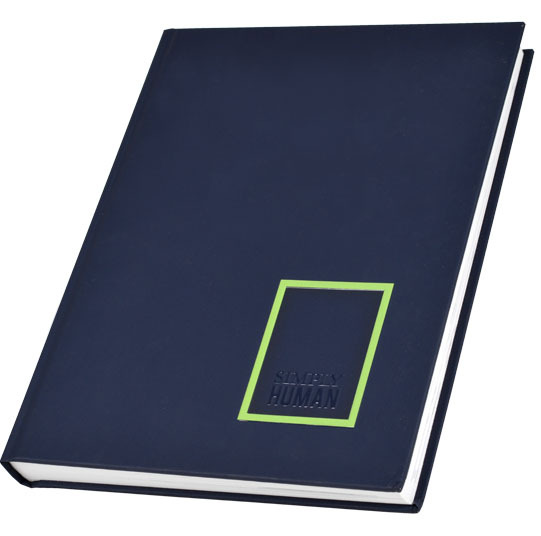 In the 2016 Valhalla, the Lynbrook yearbook staff chose to “investigate the inner workings of our school” with the theme “Disassembled.” The theme starts on the cover, which depicts a hand sketching out the theme phrase, and on the front endsheet, which shows a blueprint of the school. 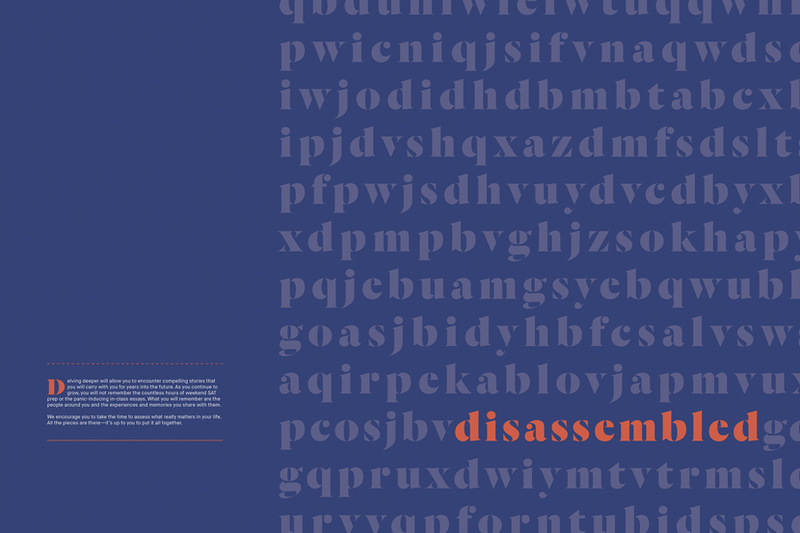 The opening copy explains that the book will be examining the year by “taking it all apart and scrutinizing the details alongside the bigger picture.” The division pages are fun collages, each showing pieces of the year. 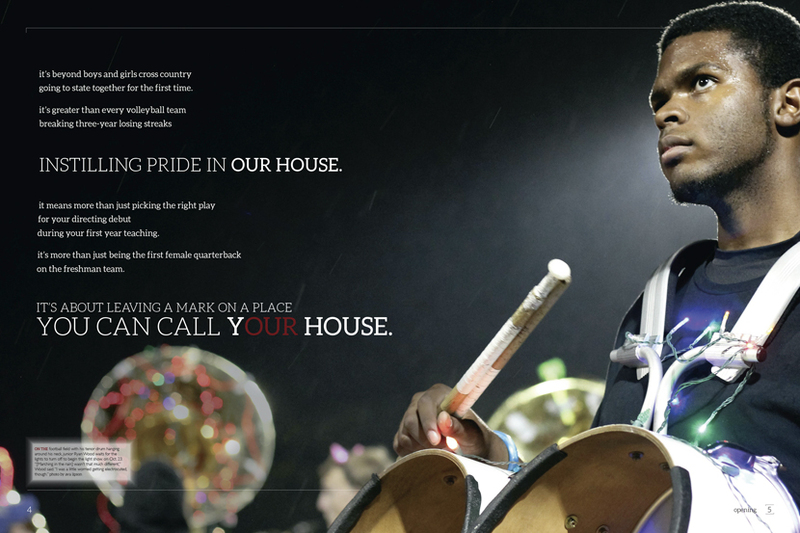 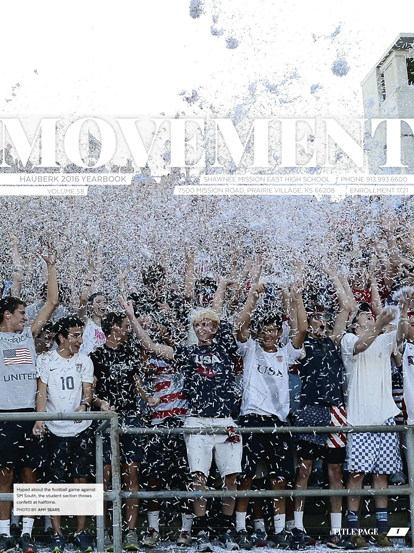 Theme: "This is Our House"
High school is a proud time for many students. 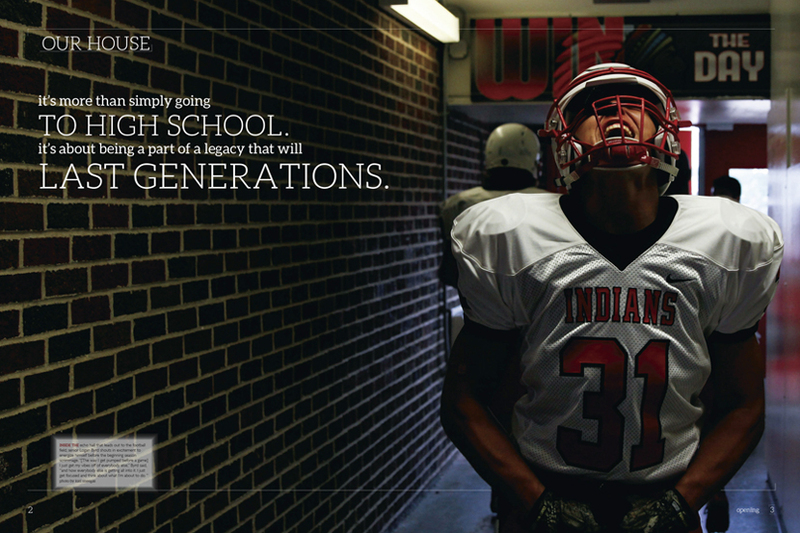 They walk the halls for four years searching for ways they can leave a legacy, while learning about themselves. 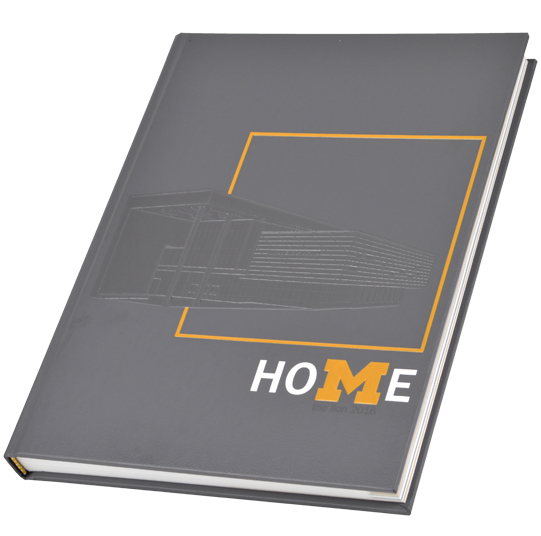 The staff of the 2016 Indian tapped into those feelings of school pride with their theme, “This is Our House.” Subtle sculpture embossing on the front and back cover in the shape of bricks gives the book the literal feel of a house. 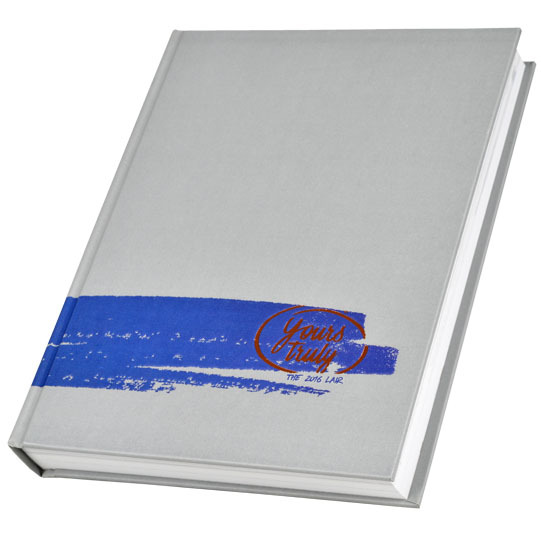 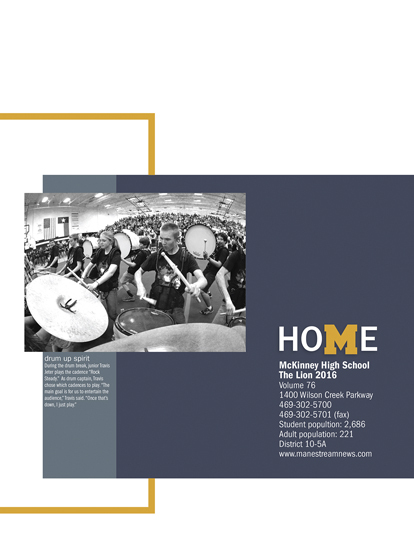 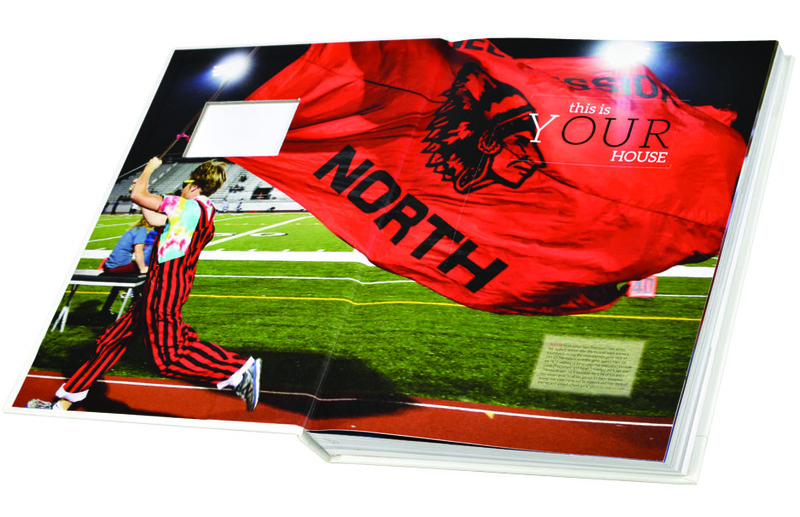 The rousing opening copy tells the reader that the year at North was about “leaving a mark on a place you can call your house.” Theme fonts and rule lines started on the cover and title page are carried through the book’s spreads consistently. 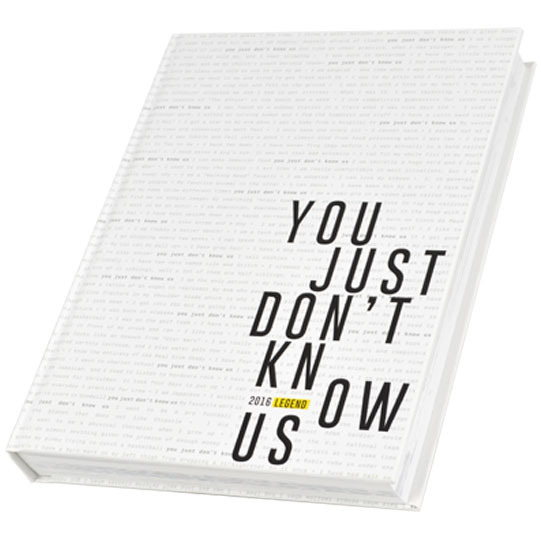 Theme: "You just don't know us"
The 2016 Legend is full of stories of students so rich that by the end of the book, you know them better. 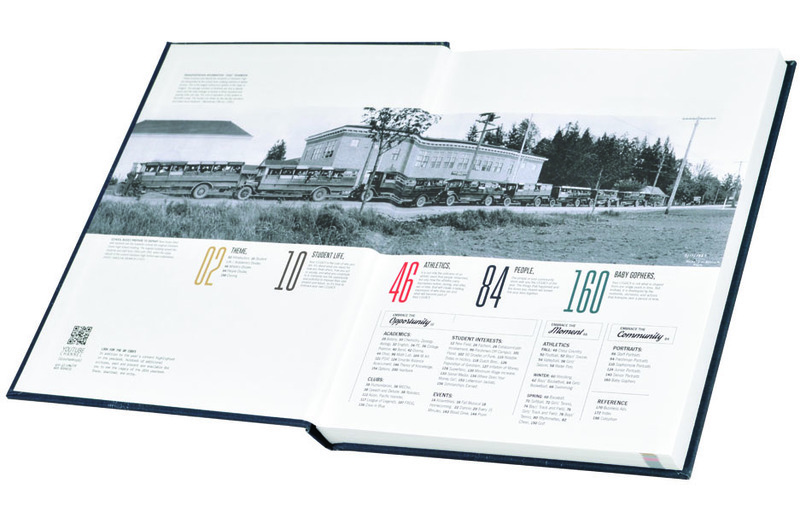 While the stories are front and center, the book’s simple design is more complex than it first appears. 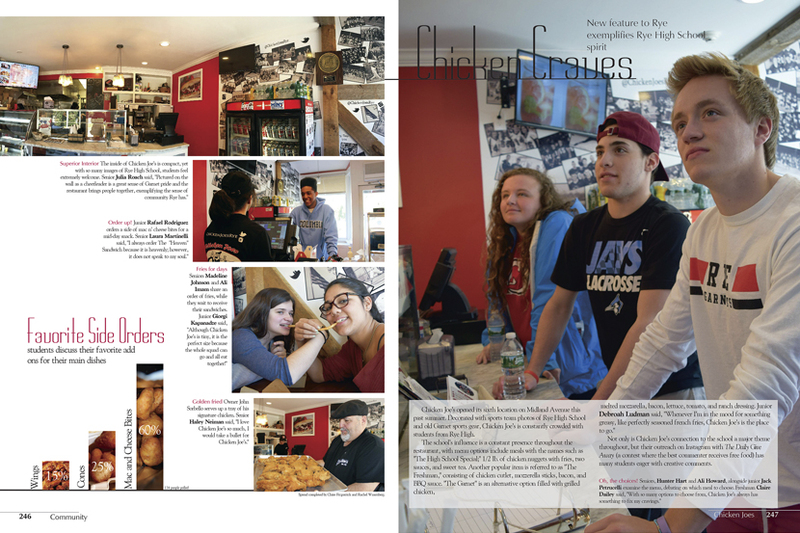 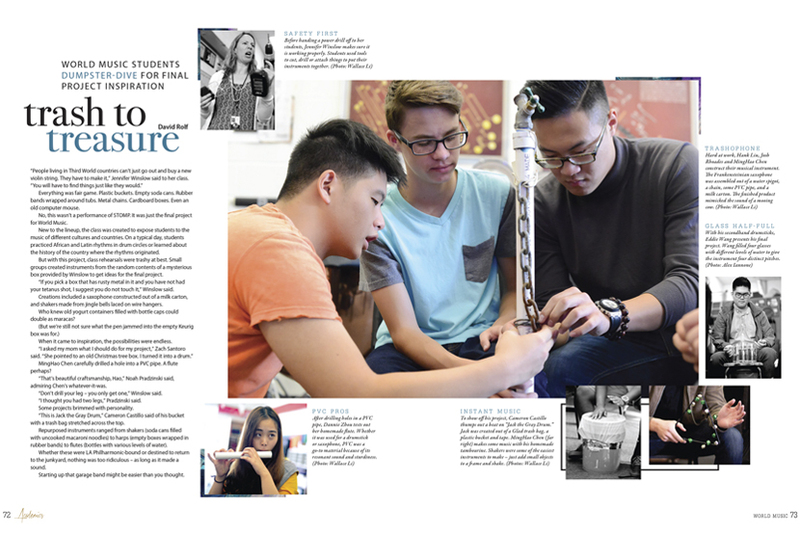 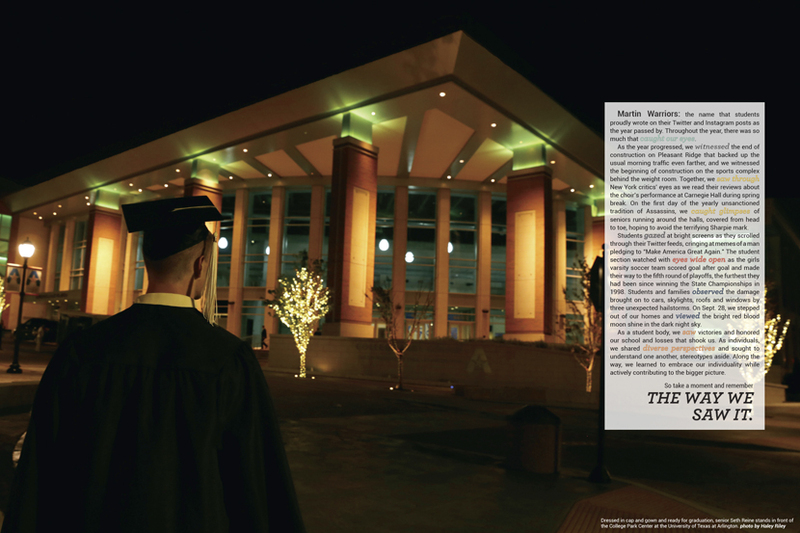 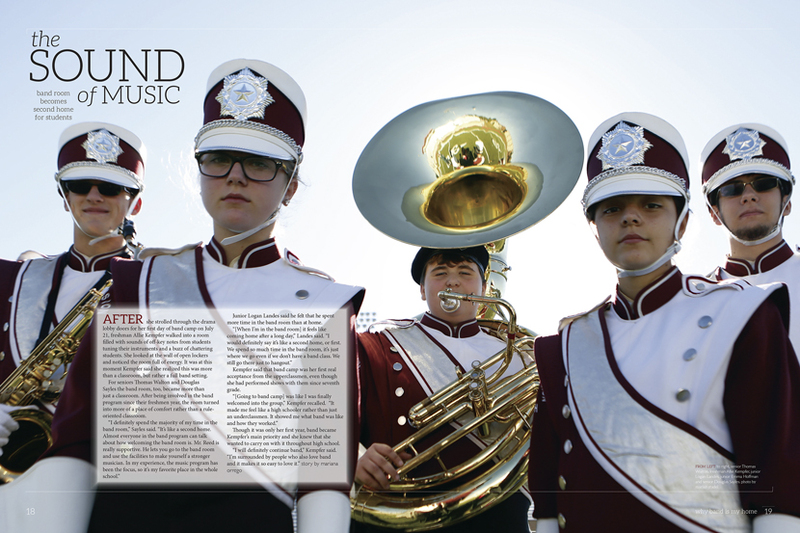 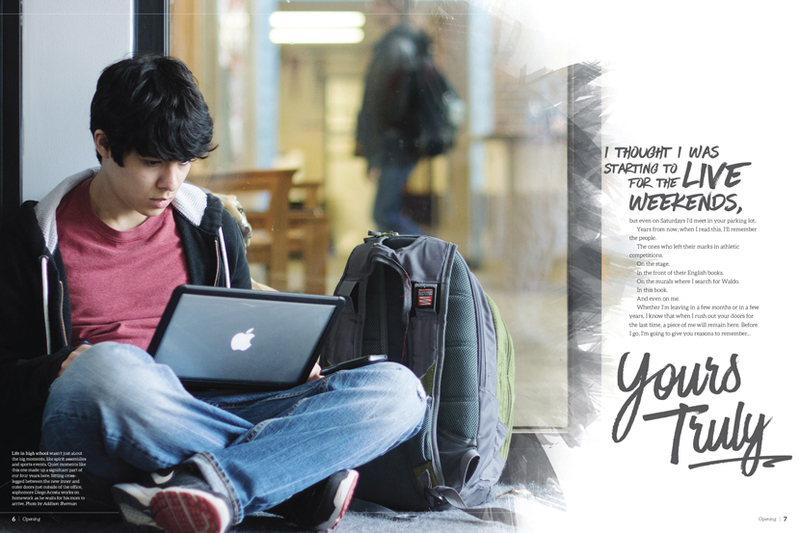 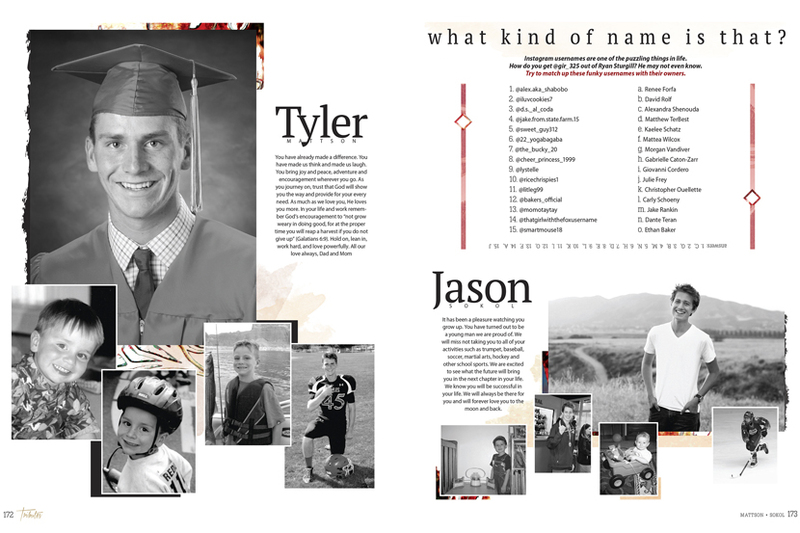 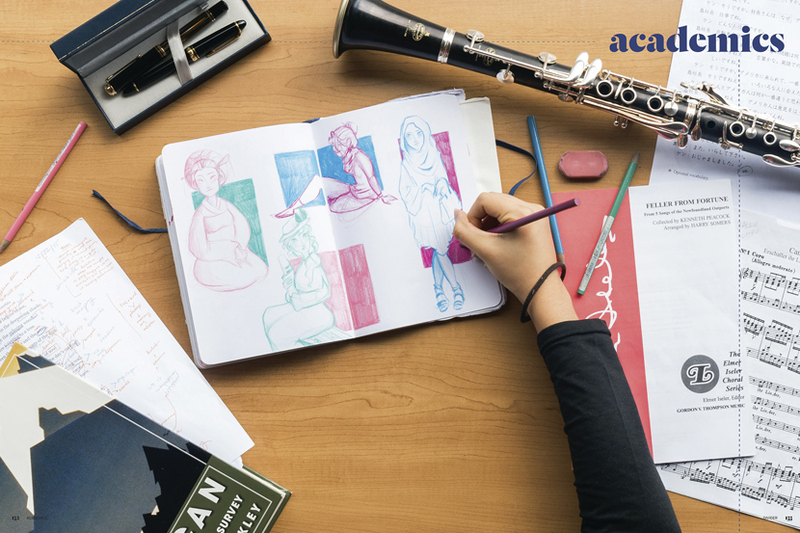 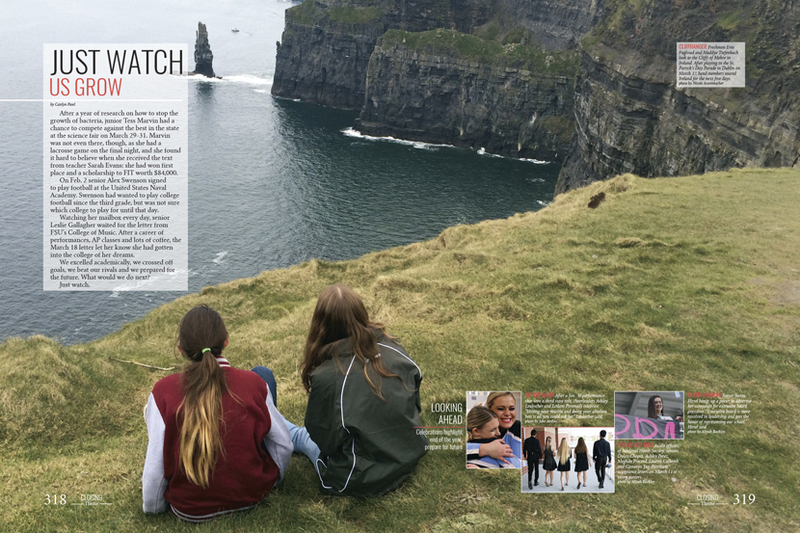 Statements of little-known facts about students are used as the background on the cover and some spreads, and they are in quote form in the folios. 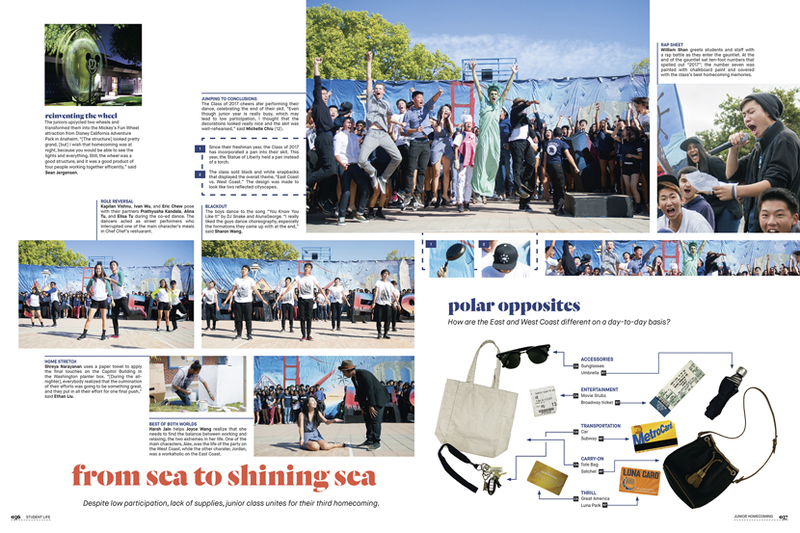 There’s also a touch of quirkiness in the headlines, which also starts on the cover with the breaking of the word “know.” The consistency of the headline pattern makes it easy to read. 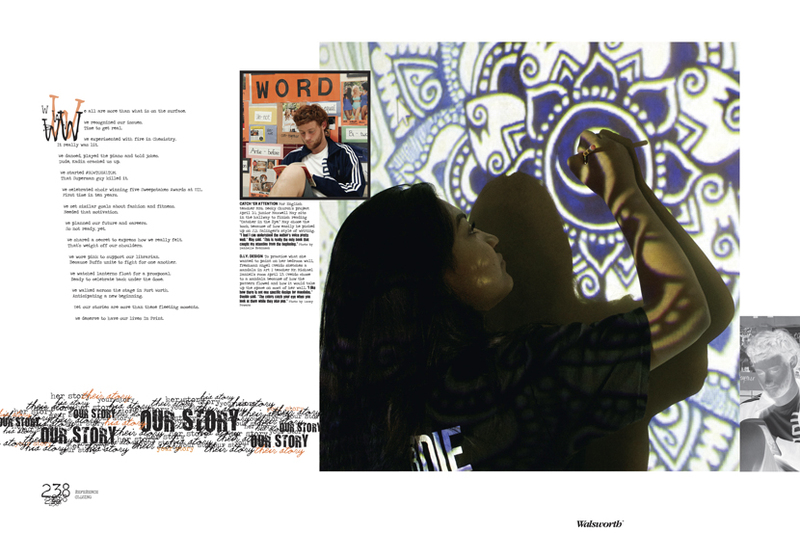 These effects keep your eyes on the pages, because you don’t know what you will see and learn. 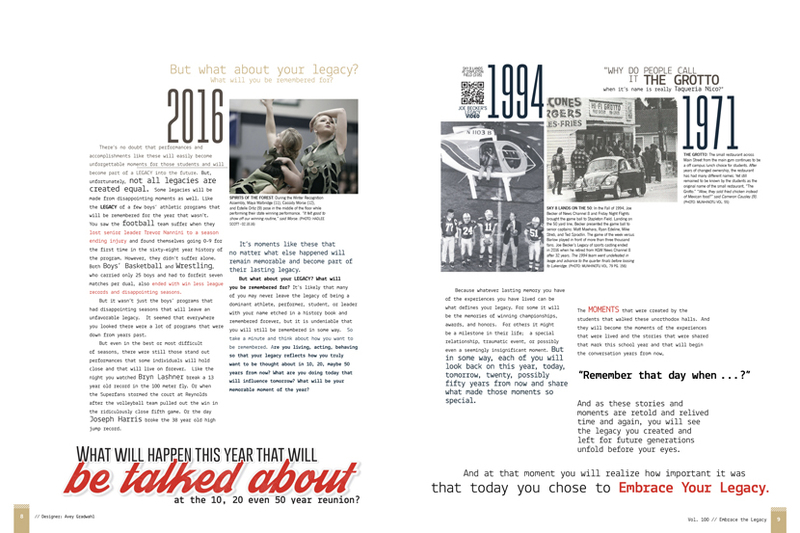 While brainstorming for a 2016 theme, the Hauberk staff wanted a concept that could address the fast-paced, always-evolving world around them. 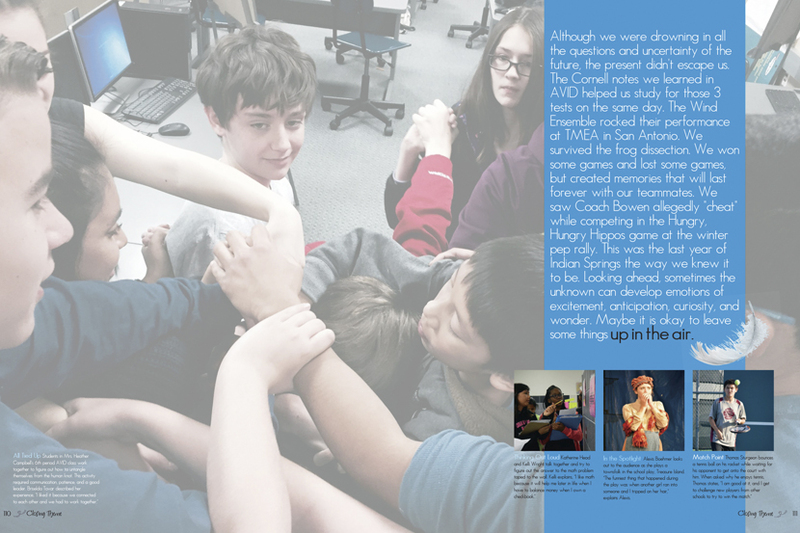 They landed on “movement,” a relevant theme that provided great freedom in design, and also allowed them to address changes in the world and right at home in their school. 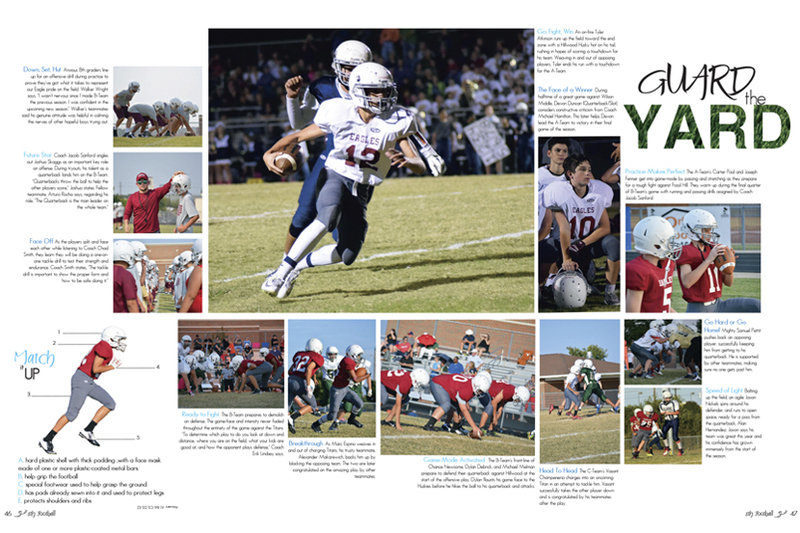 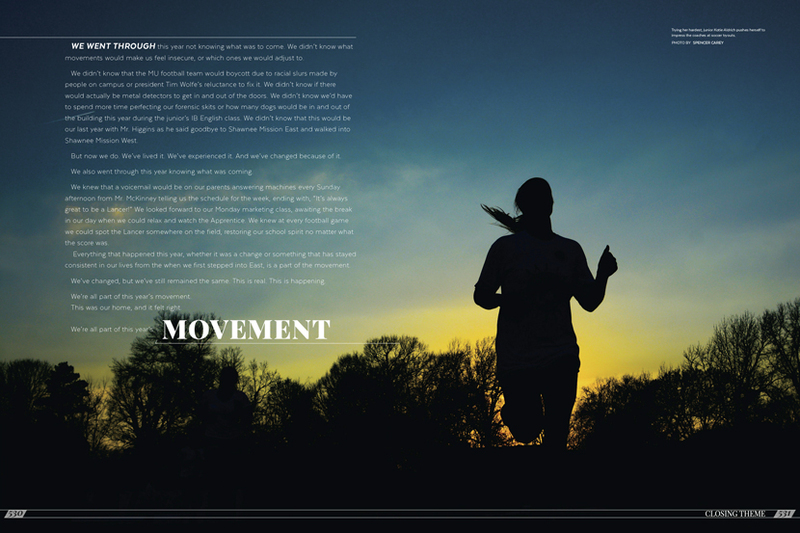 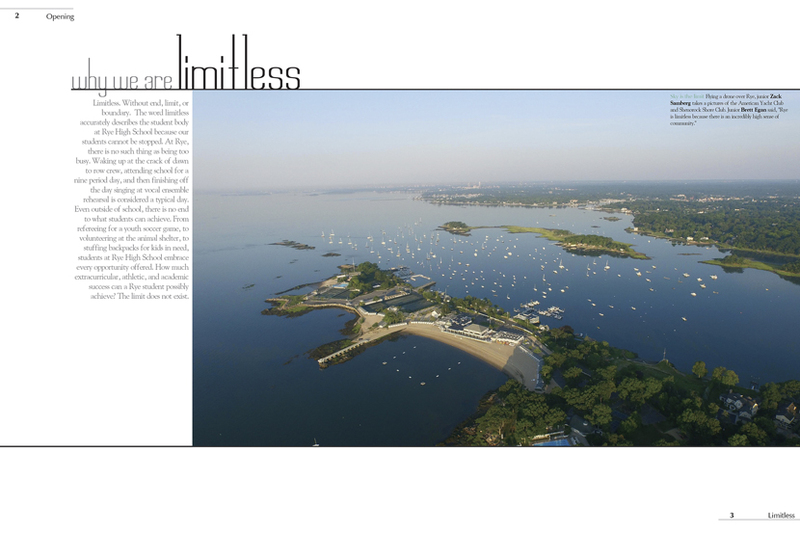 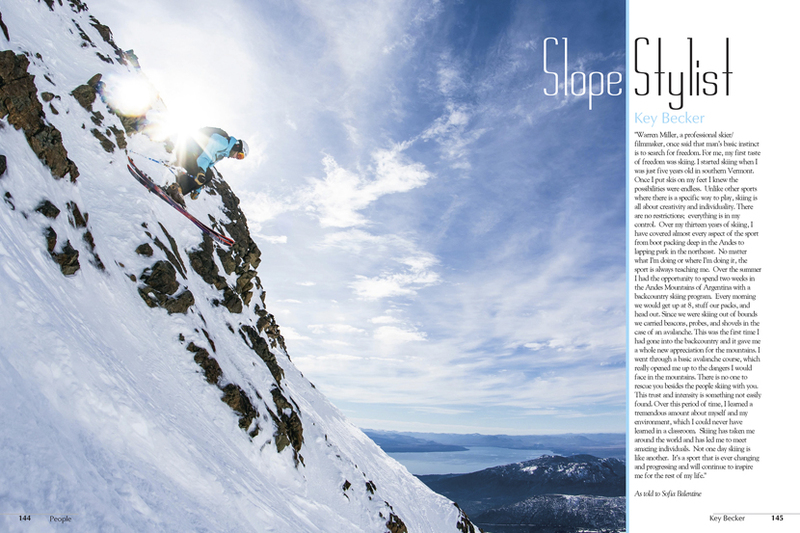 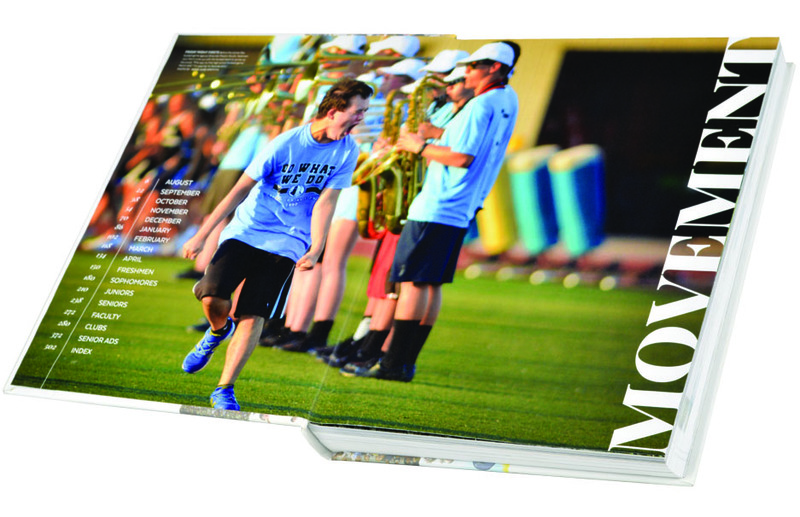 The theme starts with 44 photos on the cover (front and back), paired with a slanted line to accentuate the movement. 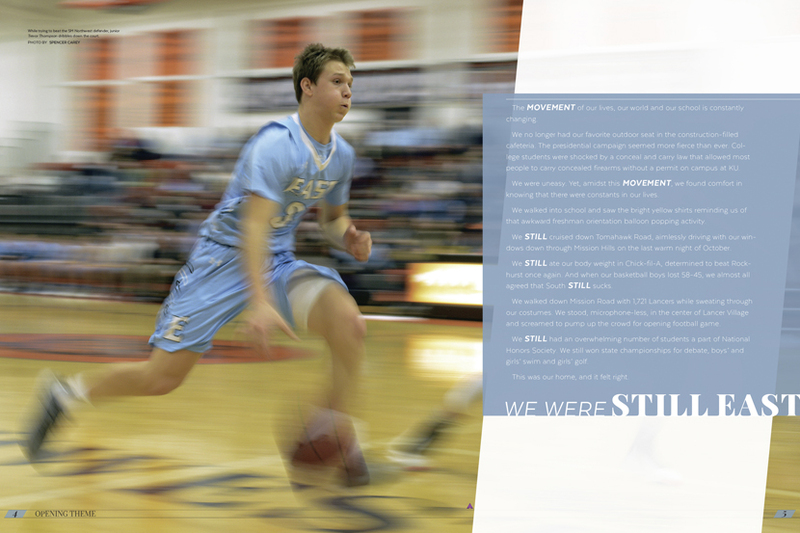 The 2016 Hauberk is filled with outstanding action photos to emphasize that things are “moving” at Shawnee Mission East. 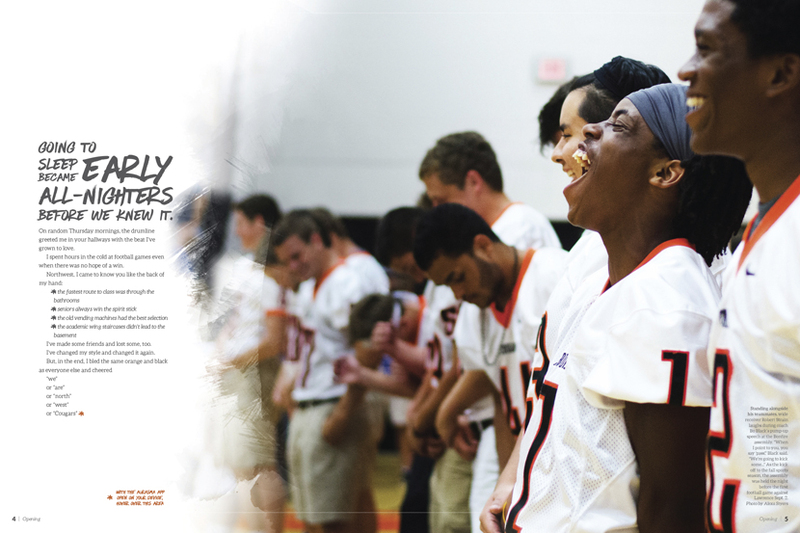 Theme consistency keeps up on the division pages with section titles and clusters of images presented the same way they were on the cover. 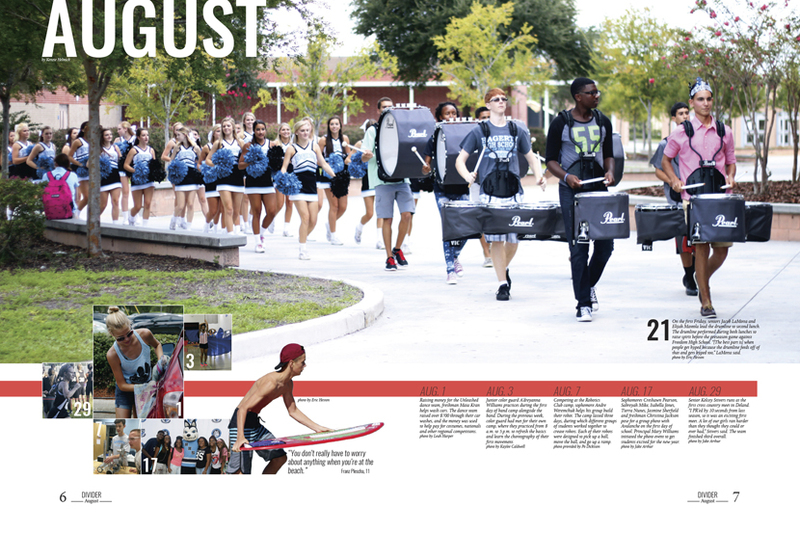 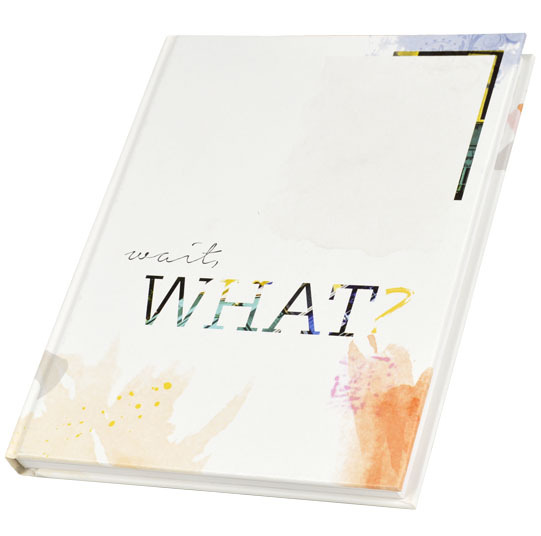 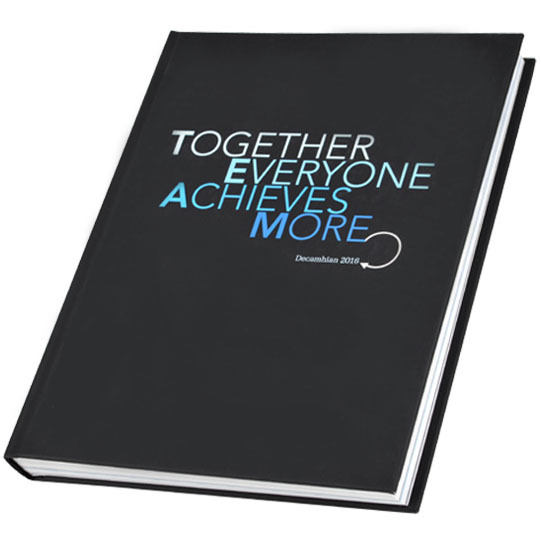 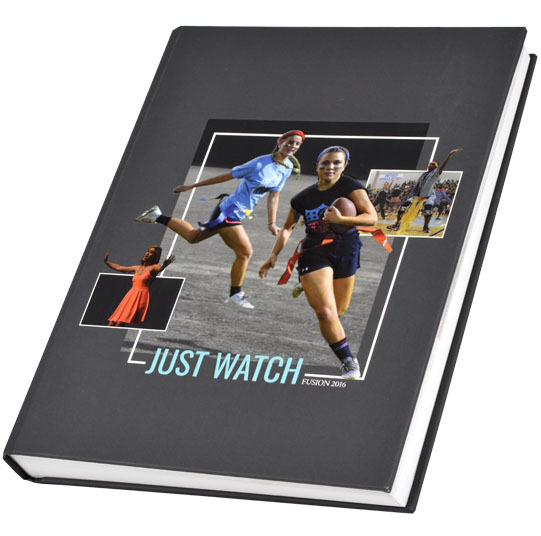 “Just Watch” the 2016 year unfold at Hagerty High School in this yearbook, organized chronologically by month. 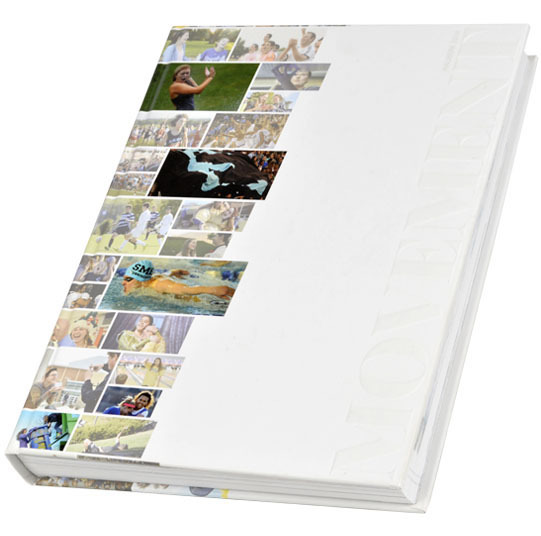 The action starts on the cover, where the images of the four students are embossed on the soft matte material. 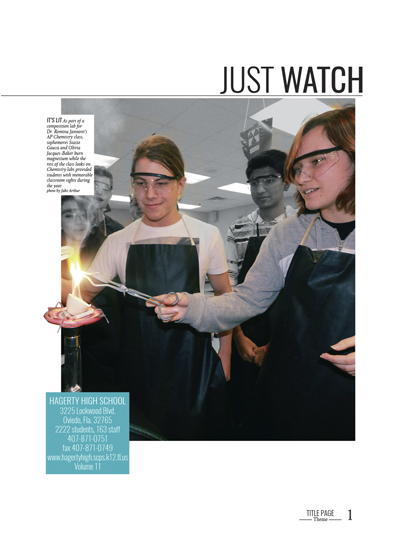 Even the title page gives readers something to watch, with students burning magnesium. 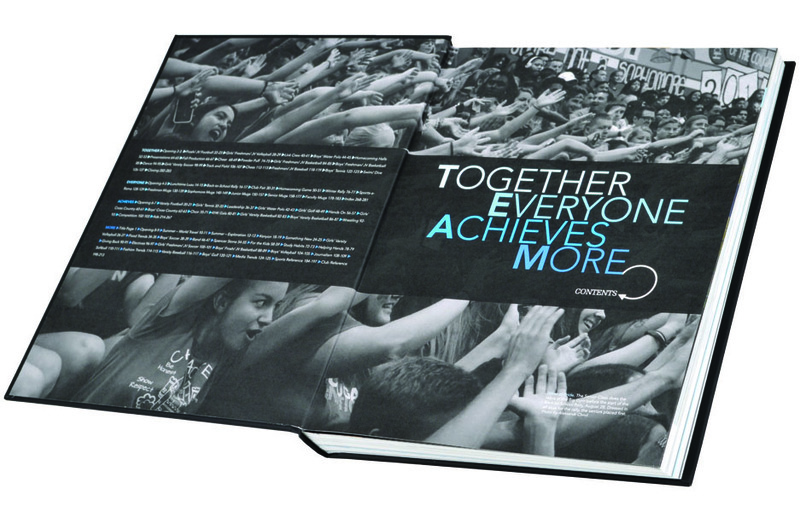 The rectangle on the cover is used throughout the book with images and copy, but the effect is subtle. 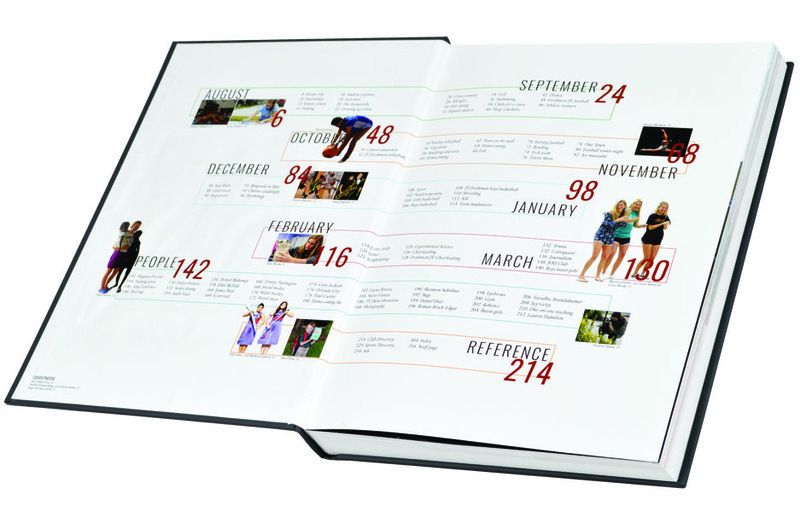 The date is the caption header for the images on the divider spreads. 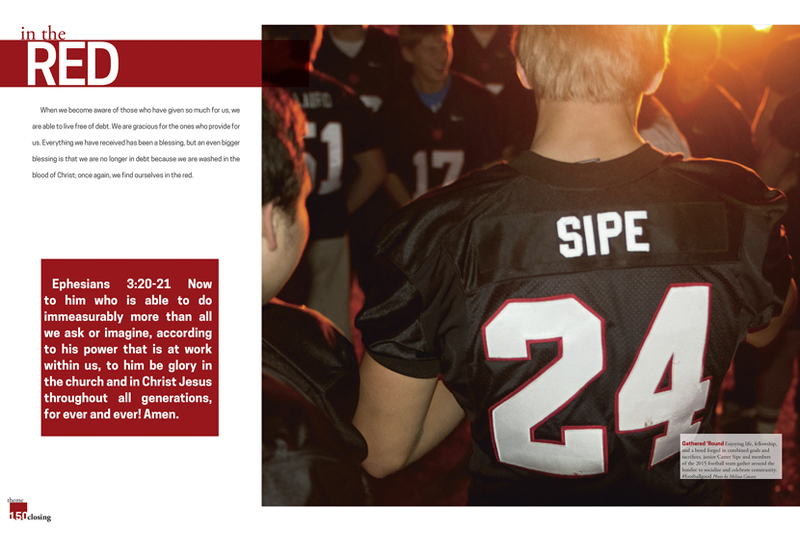 Numbers are also used in large graphics for poll results, another consistent subtlety. 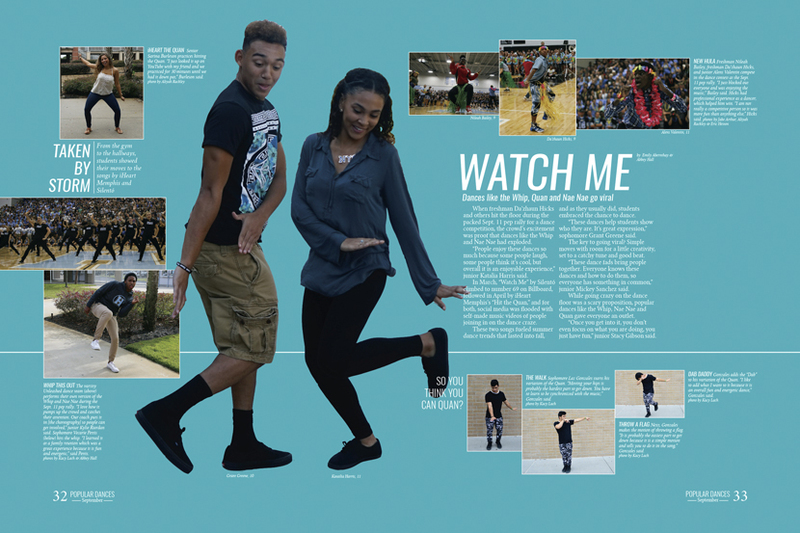 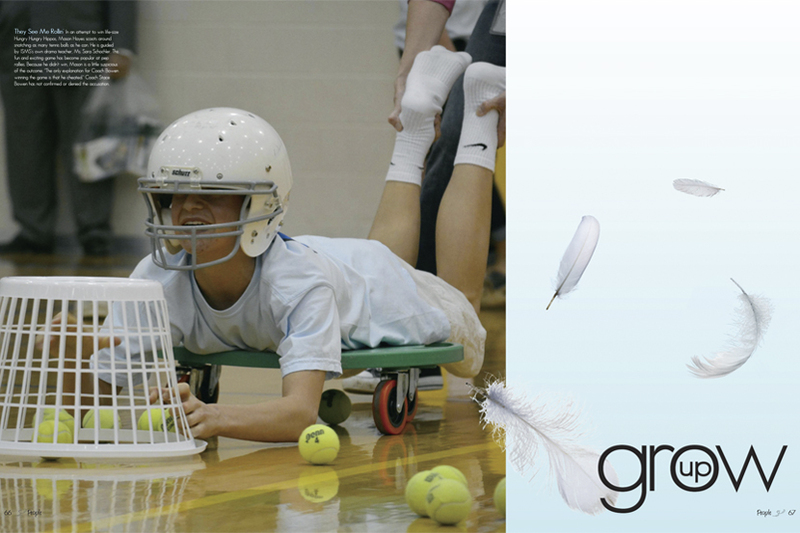 Theme: "Up in the Air"
For the students at Indian Springs Middle School, the 2015-16 school year marked the end of an era. 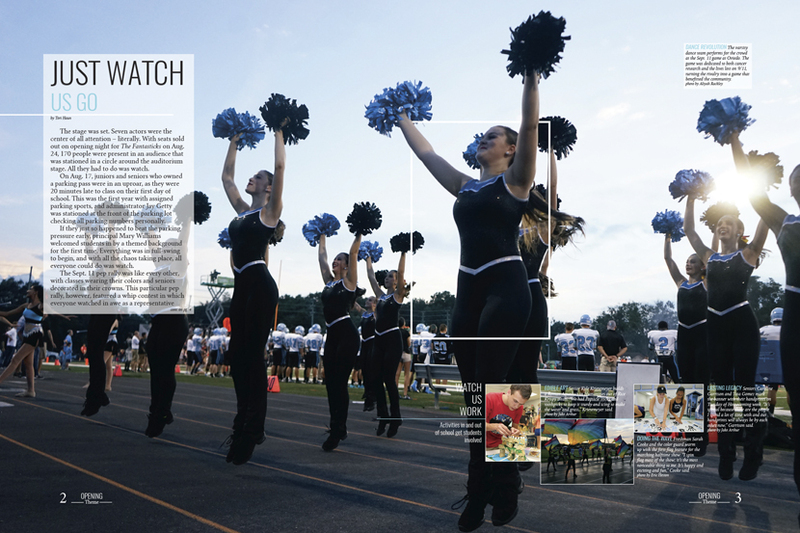 Changes loomed on the horizon, with Indian Springs preparing to add another grade level the next year. 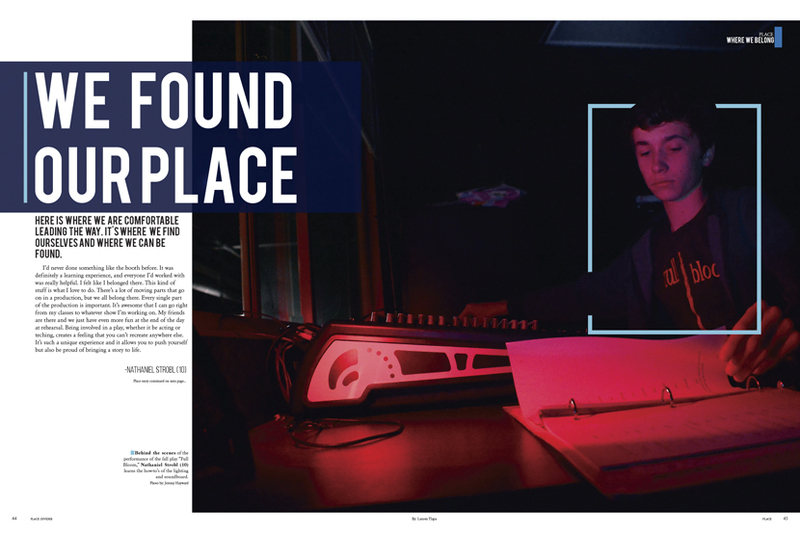 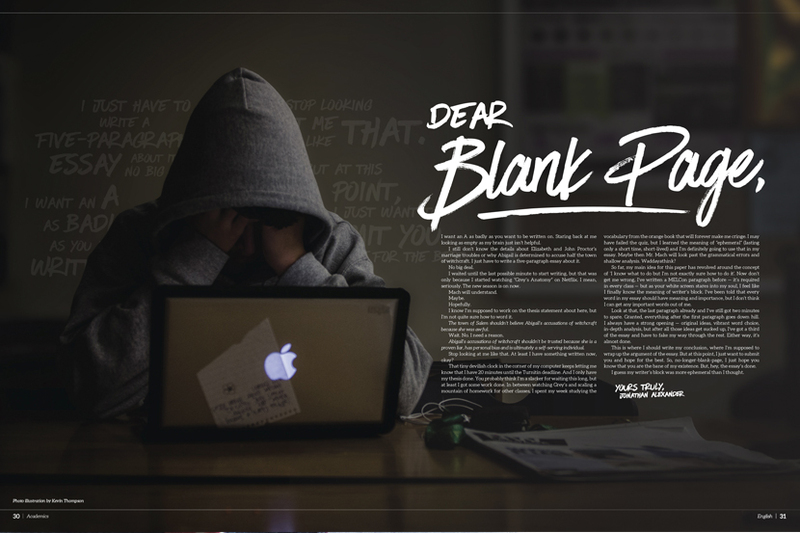 In the opening pages of the Talon, the staff took a curious and introspective tone, asking questions about what the future might hold and saying, “Not having all the answers was unsettling. 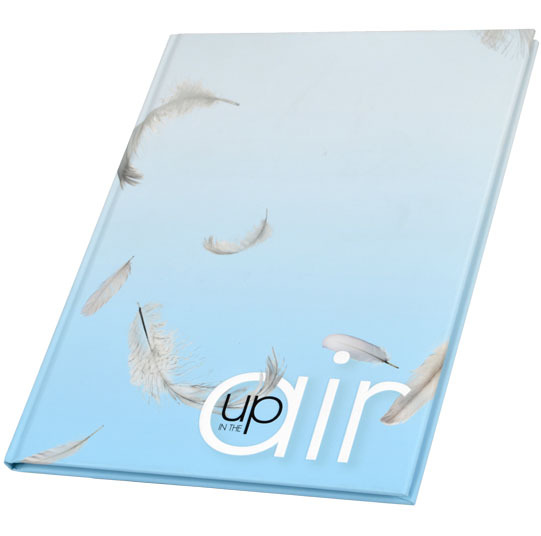 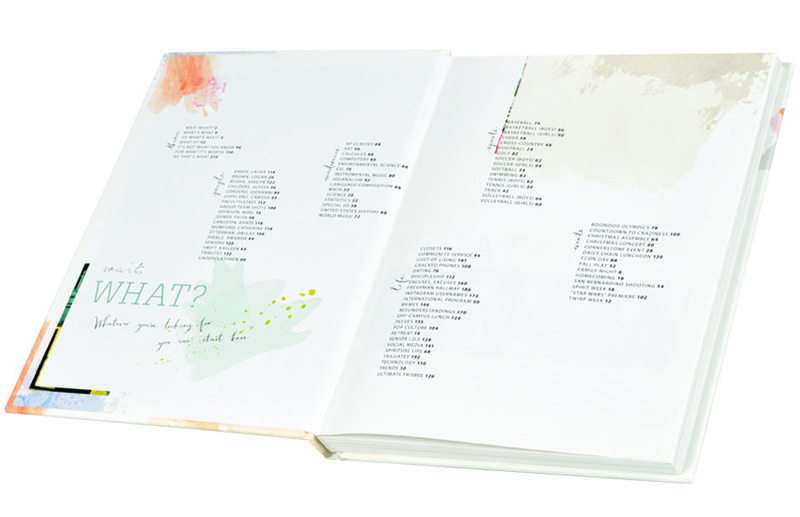 It left everything up in the air.” The staff chose to visually represent “Up in the Air” with images of floating feathers, which appear on the cover, division pages and several spreads. 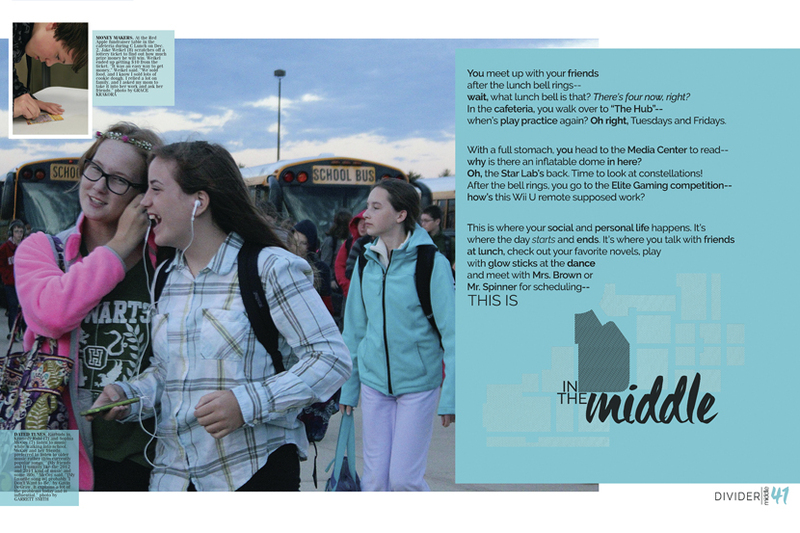 The coverage works well for the middle school audience, sticking to quick reads and mods. 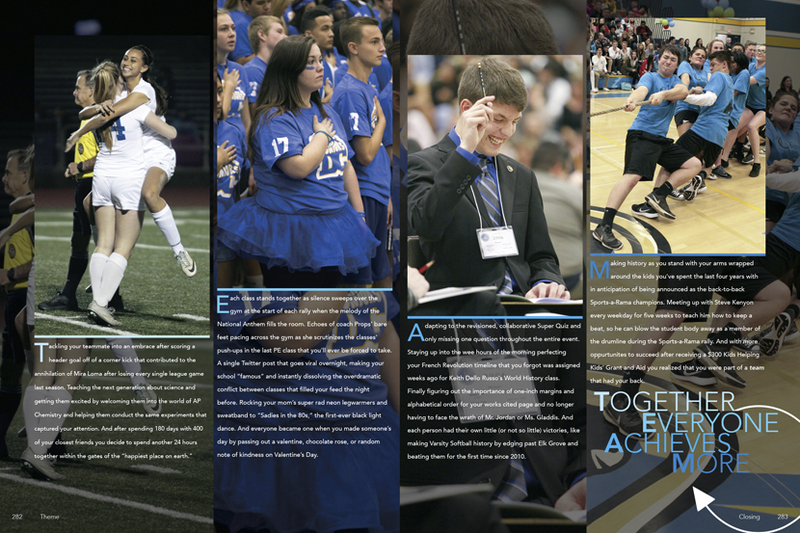 Theme: "Together Everyone Achieves More"
You might be familiar with the phrase, but the 2016 Decamhian staff took a fresh take on how the student body was a TEAM, “Together Everyone Achieves More.” Graphically, the theme was carried out with an arrow curved into almost a complete circle and four shades of blue (a school color), one for each theme word. 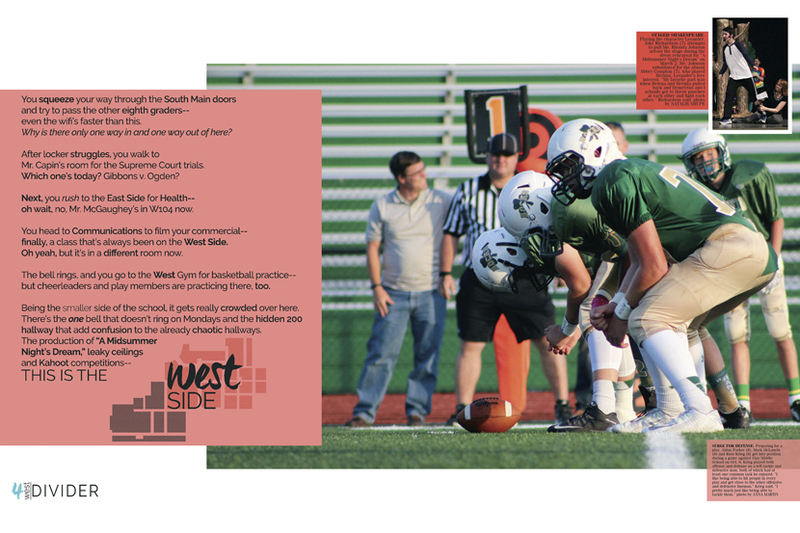 Each theme word is a section title, with spreads placed in the sections based on the use of a theme word in the headline or subhead. 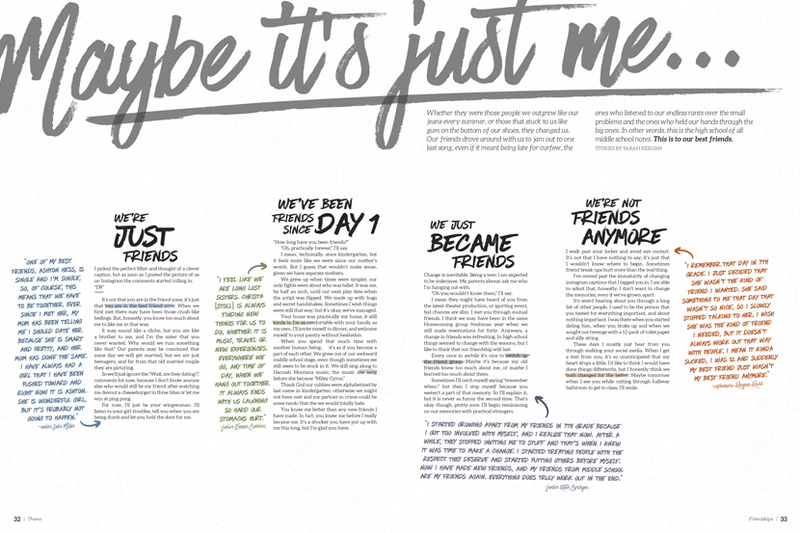 Sometimes the curved arrow substituted for a letter in a headline word. 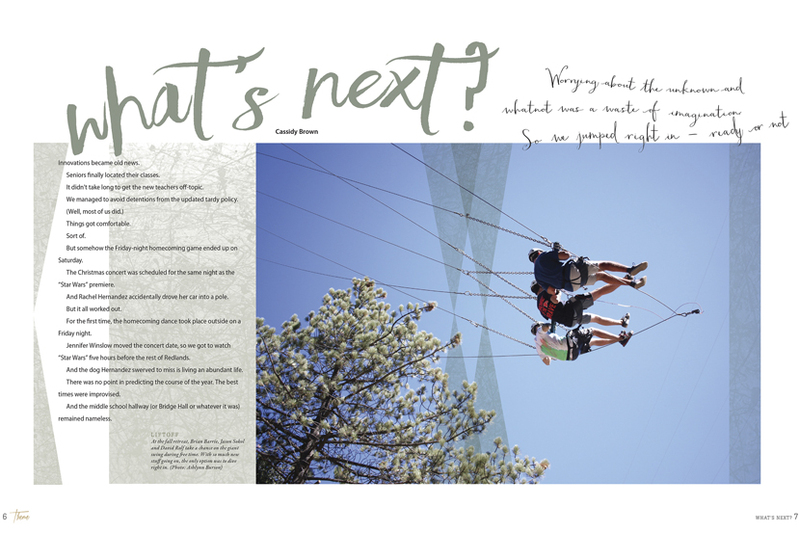 The topics and usual section delineations (student life, sports, etc.) 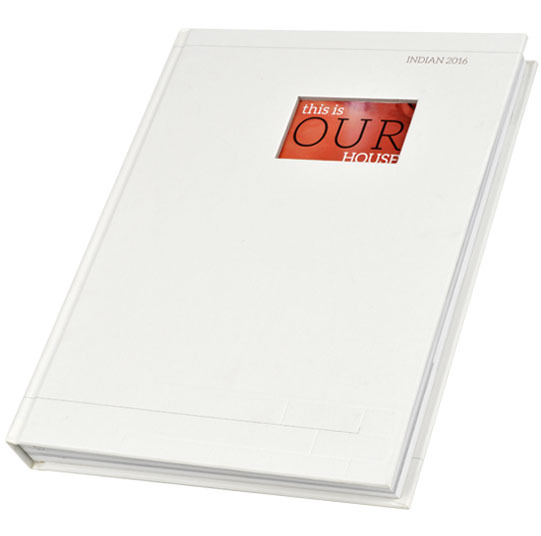 are included in the folios. 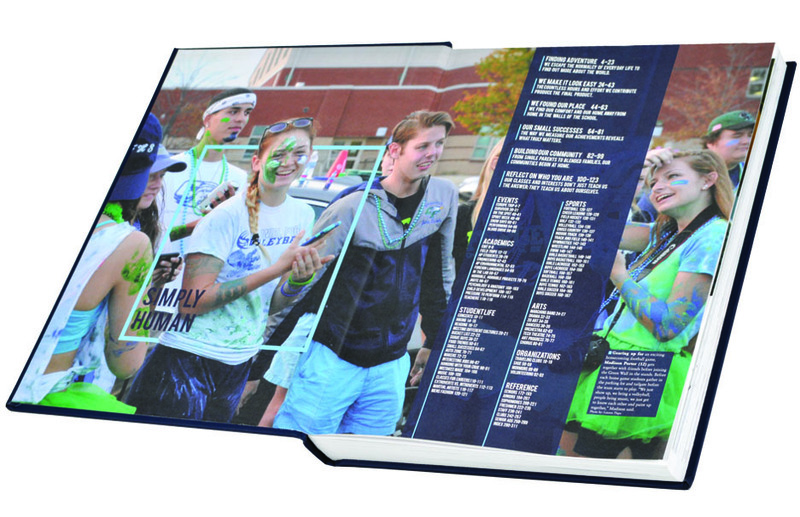 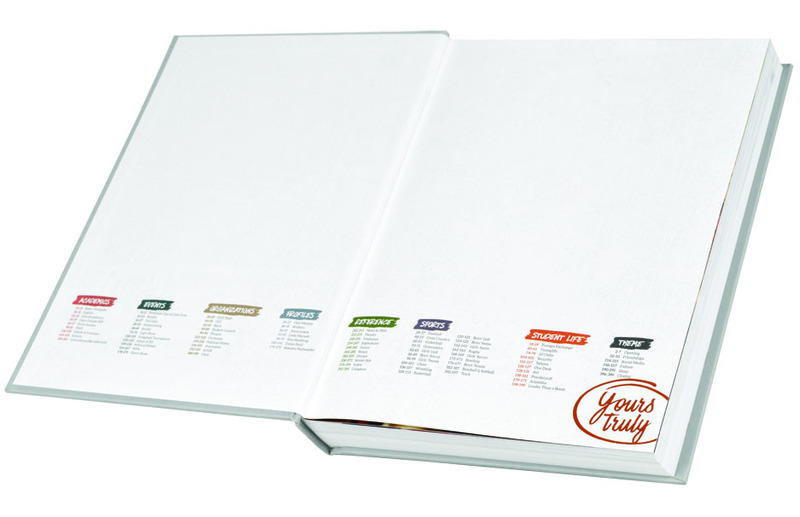 Creating anniversary yearbooks are a big responsibility for a staff, especially an important milestone like a 100th anniversary. 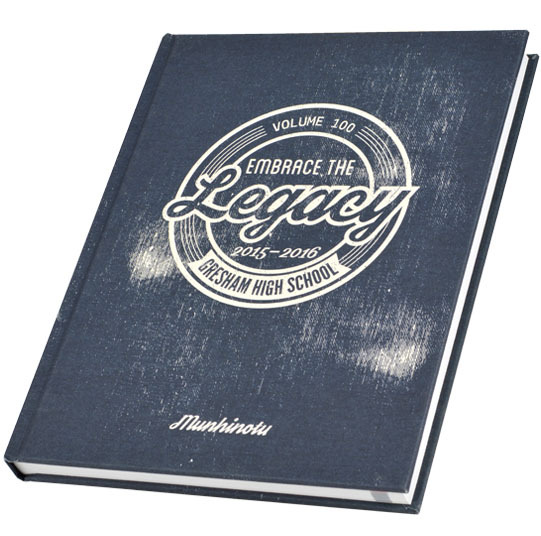 That was the challenge faced by the Gresham staff with the 2016 Munhinotu. 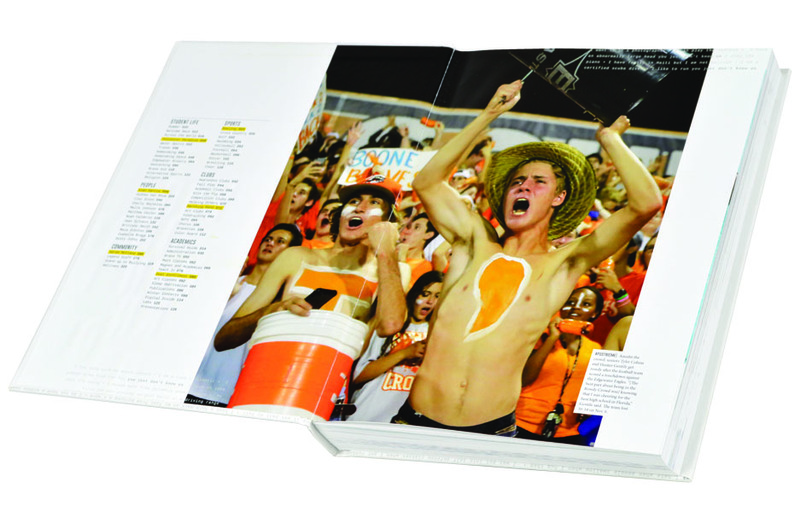 As explained in the colophon, some staffers started pondering the 100th edition as early as January 2015. 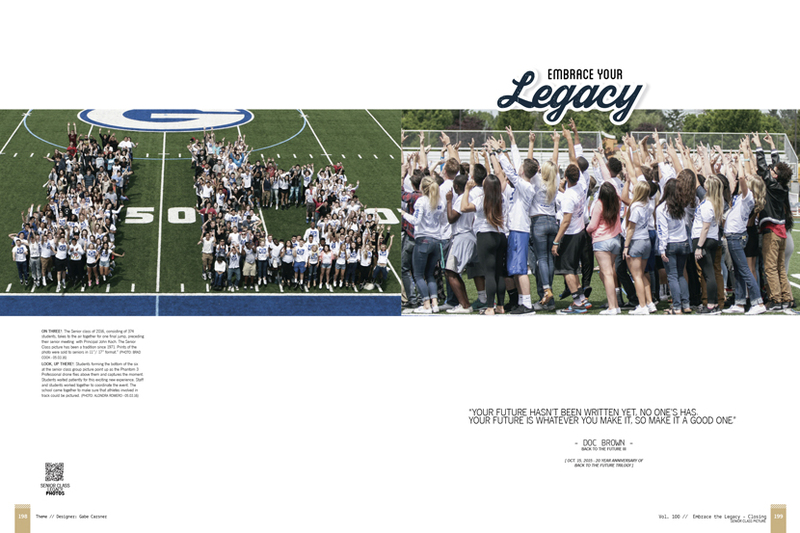 The theme, “Embrace the Legacy,” came early in the year, and it’s a good thing. 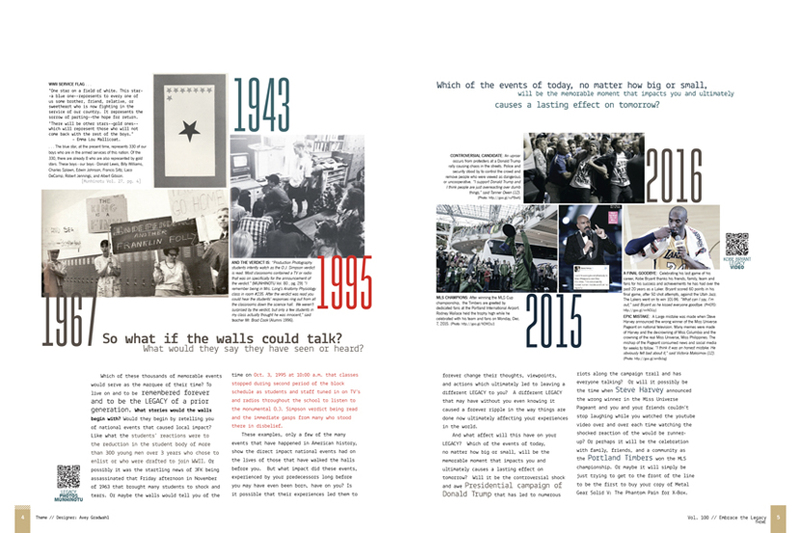 A massive amount of work went into unearthing all the historical pictures and stories interwoven through the opening and division pages. 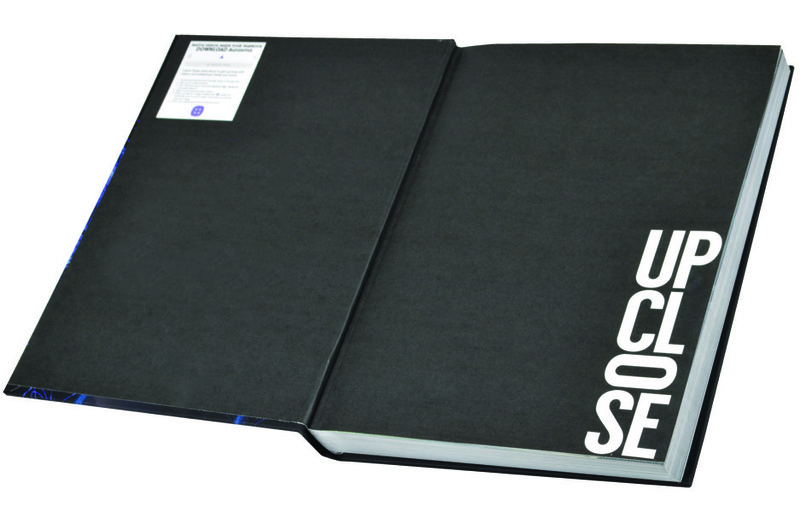 The theme logo on the cover uses the fonts Streetwear and Gobold High, and those fonts are used on headlines throughout the book. 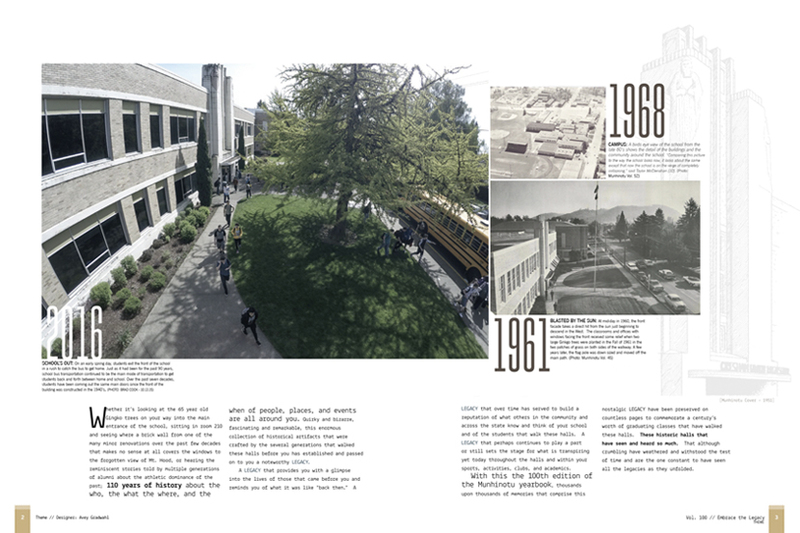 Several images from present day appear in black and white, contributing to the book’s overall throwback feel.